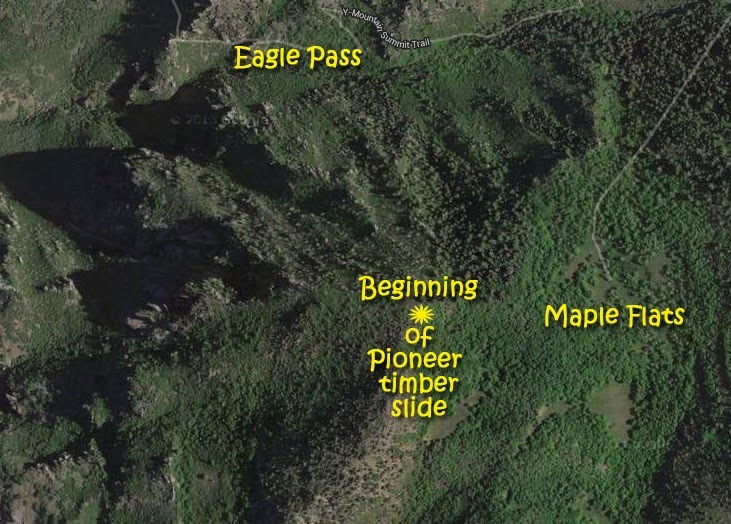 Trip #4 Attempt: WHERE EAGLES DARE…searching for Pioneer Timber Slide…. This is the title of one of Clint Eastwood’s great movies. The weather is a bit questionable but will attempt to do it on Friday & Saturday, August 1st & 2nd. 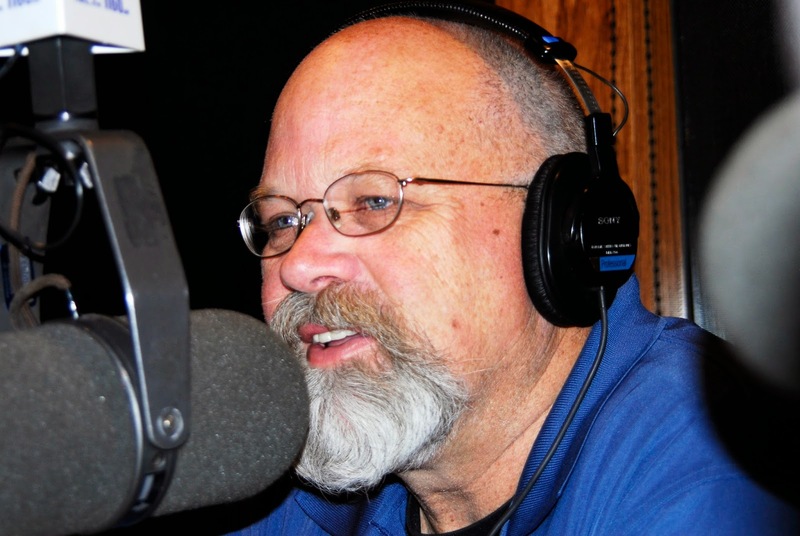 NOTE: See at the end of this post, Who Google Search categorizes me with? 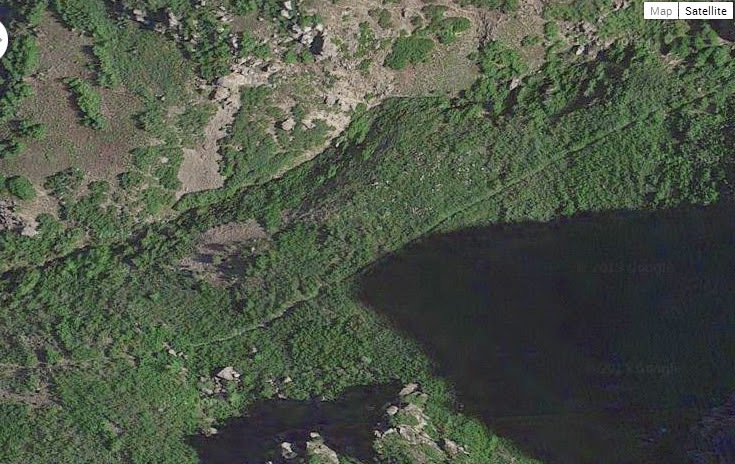 I first attempted what was supposed to be an overnight backpack leaving on July 23rd and intending to be exploring for remnants of the little known “Pioneer timber slide” above Provo, Utah on PIONEER DAY. The problem was that I had too many errands to run and so didn’t leave the Y-Mountain Trailhead until 2:30 PM when the temperature there was 104 degrees F. So it quickly got real tough for this old guy. 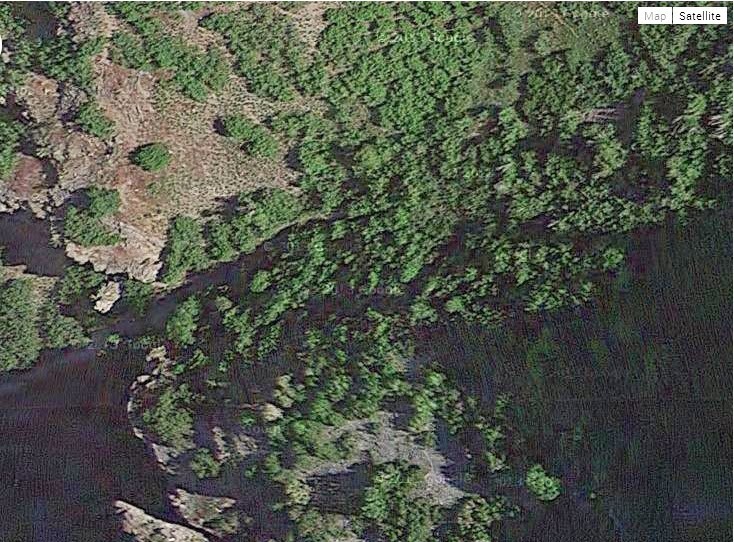 Looking up WHERE EAGLES DARE on Eagle Pass…..by the way that is the name of a Clint Eastwood movie.. There were a few on the trail….very few….this mom and her overheated daughter sliding down the trail…without a smile on their sweaty faces…. 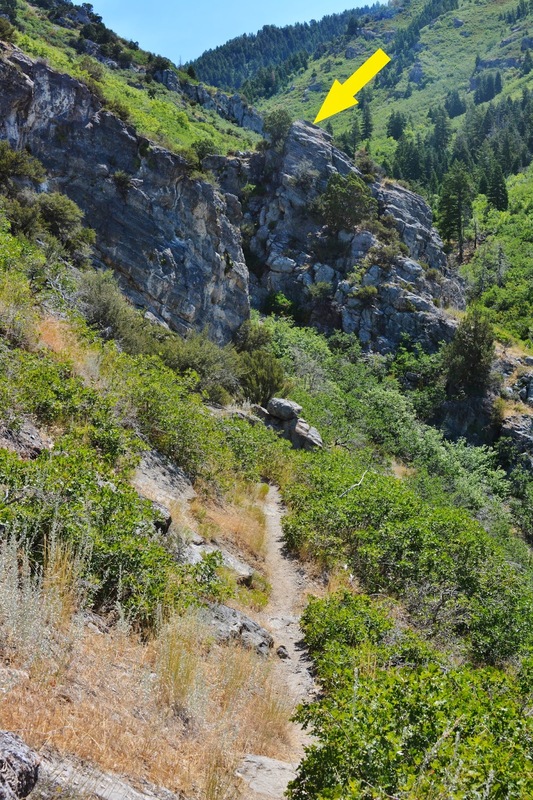 As I turned to admire what the pioneers had done to Utah Valley, I began feeling a bit light headed…..spotting mirages down in Provo….and as I proceeded up the trail began to feel like I didn’t weigh anything….my body struggling up the trail and my spirit continually separating a bit floating behind! So I let wisdom take over and I “chickened out” and headed down the mountain. There would be another day….even for this old guy…..and for sure going early would be better. Two days later, July 25th I awoke at 6:00 AM and by 8:00 was on the trail in the SHADE. My Smart phone told me it was 61 degrees in Provo….43 degrees cooler! There were many on the trail…..the smart ones coming down already, almost beating the sun. A few were on the top of the Y enjoying the awesome view. …and all having a great time seeing what the pioneers had started…and what the Brigham Young Academy in I 1875 was developing into! 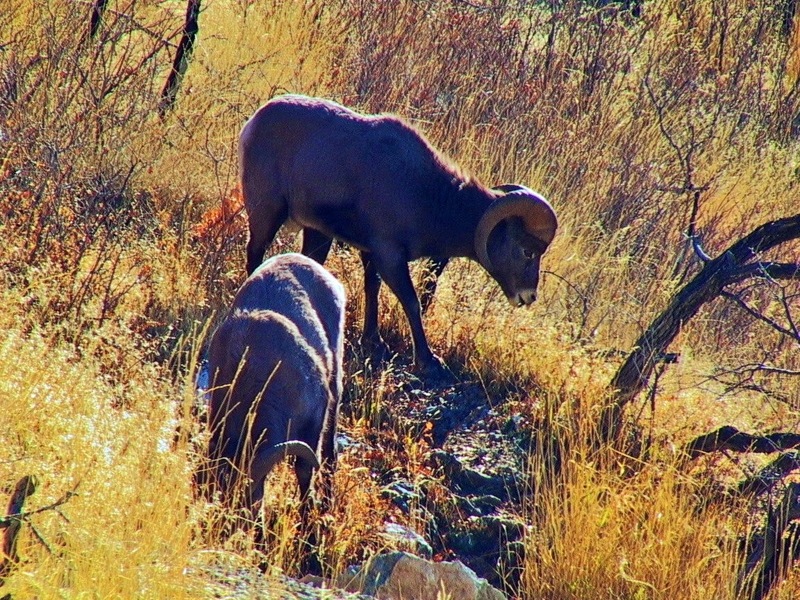 I continued up the trail towards Eagle Pass….picture from a previous trip in the Fall as is the shot below of Rocky Mountain sheep above the Y. This trip the prevalent wildlife seemed to just be frequent lizards. ….to Rock Canyon on the north…..
….and from Eagle Pass zooming in on the BYU sports complex: Track & Field on the left, the Marriott Center for basket ball, the Larry H. Miller Baseball Field, and the LaVell Edwards Football Stadium…WOW…AM I EXCITED ABOUT THE UPCOMING FOOTBALL SEASON!. Looking down in a Fall photograph we see an old trail that must have been from the pioneers, and it continues up the ravine of Slide Canyon. 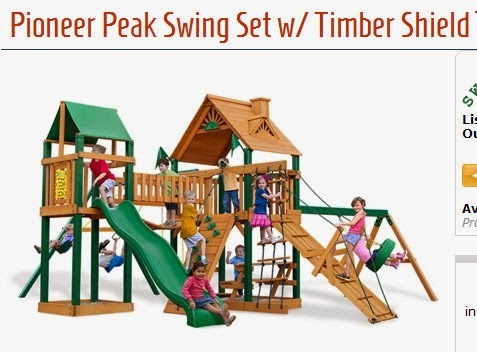 Was it also a timber slide pathway? I show more of this at the end of this report. 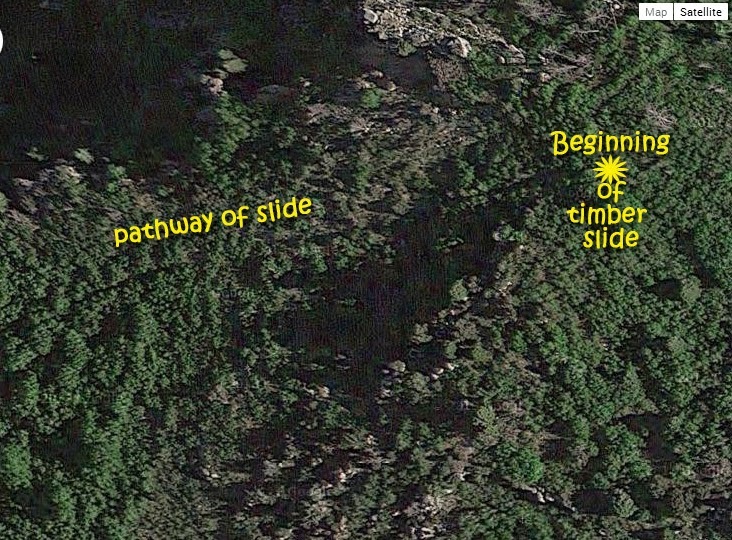 My research has turned up very little, just mentions of the “timber slide,” but no details. 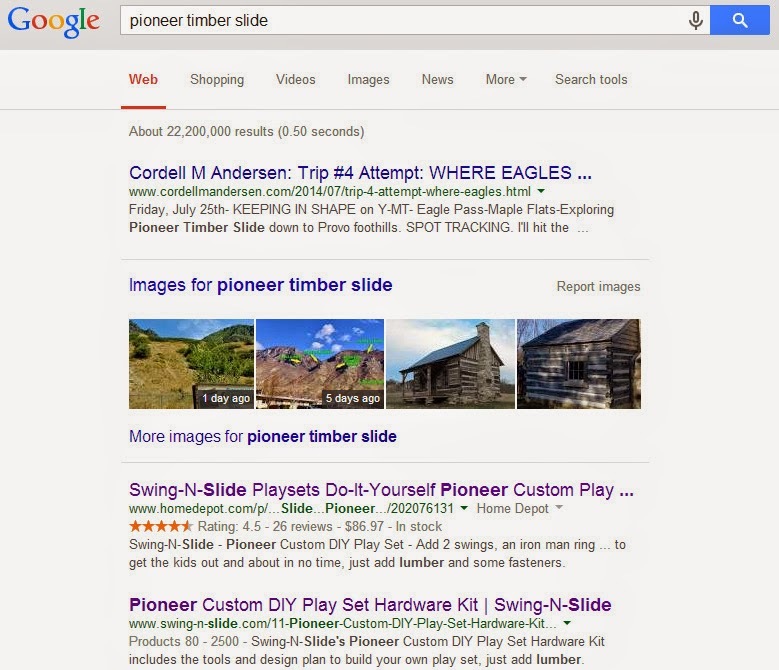 One of my reports of the failed attempt has already got me on the Google list concerning timber slides. ….. with the arrow pointing at it from where the next couple of pictures will be taken. Looking back to the 1st….and then zooming in on it. Now looking up the 3rd after which we eventually come to the first meadow. And of course there just had to be a GOLDEN EAGLE! …….like when working at Provo Steel & Supply in 1955 hearing that some of the guys were going up there deer hunting the next morning, I got off work around 4:00 quickly prepared my pack, hiked all the way up high above Slide Canyon and Maple Flats, and threw down my sleeping bag on a deer trail with a good view of what would come up from below. Still in my sleeping bag the next morning I saw the guys way down in the canyon beginning to come up the mountain. Soon the deer paraded in front of me. Still in my sleeping bag I rolled over, shot the biggest buck, then got dressed, packed up, gutted the buck and started the drag….saying hi to the guys along the way (they hated me for a while! ), and continued down the switch-backing trail through Eagle Pass area, over the Y and down, all done in a matter of maybe 18 hours. I can’t even imagine today how I ever did that….. the mountain must have been smaller back then! One deer hunt there was snow on the mountain, but after work or school I high-tailed it up here and in this meadow with a bit of snow on it threw down my air mattress and sleeping bag and covered myself with my poncho. During the long, cold night I heard deer snorting all around me–wondering if I wouldn’t get stomped on, and tried to move to see as there was a good moon, but the poncho was frozen and the crackling had the herd thunder off. Next morning I continued up the trail and then traversed back around the mountain seen in the previous photos. There was a thick crust on the snow and I was making all kinds of racket….but rather than scare off a buck, it got him curious and all of a sudden I noticed 20 yards ahead of me a buck sort of squatting down with his front legs flared out to look under branches to see what was making so much noise. I dropped to my knee and with one shot dropped him right on the spot….another long drag proceeded and again we ate that winter….healthy “grass fed” venison! 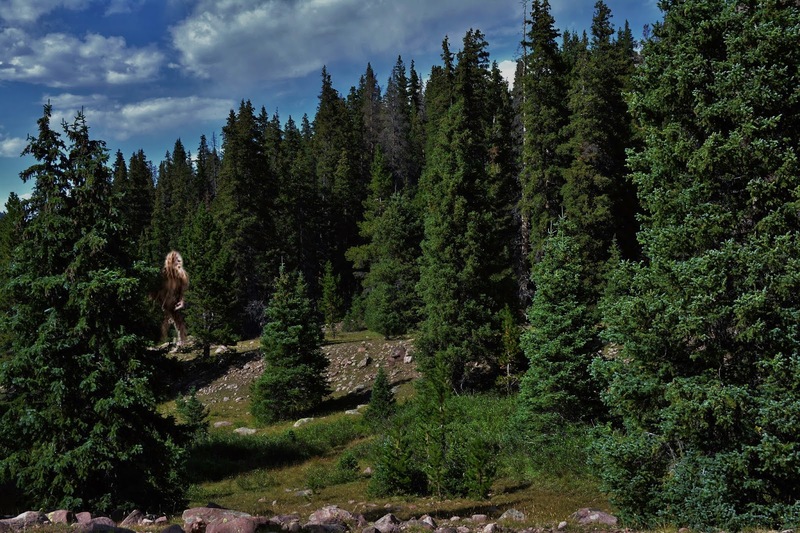 The vegetation under the quaking aspens was lush….to say the least. I had continued up from the meadows to see if I couldn’t find signs of pioneer timber operations, and soon came to a junction….that was almost missed. The trail to the left is the Y-Mountain summit trail. 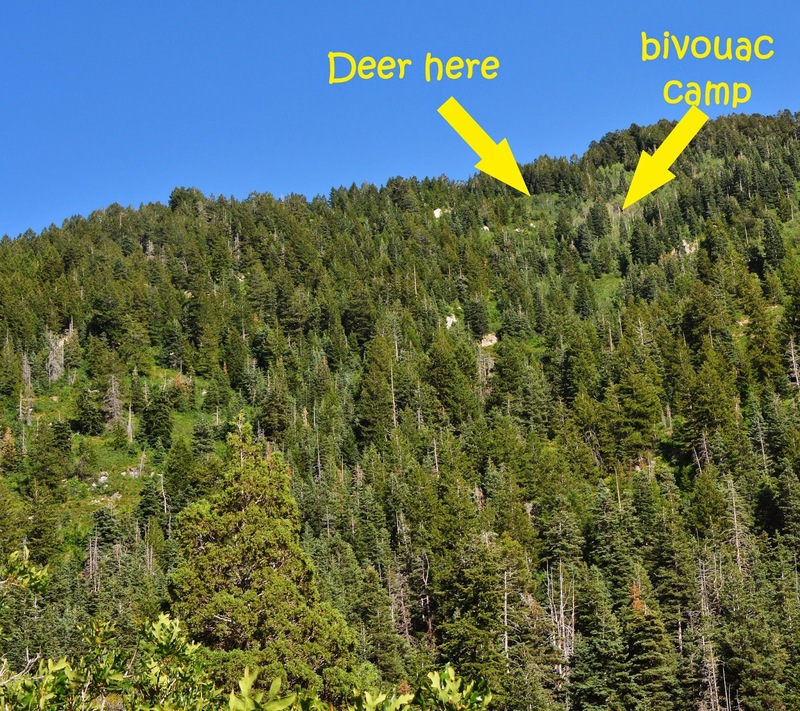 To the right, almost hidden by the vegetation, is the main trail to Slate Canyon and up to the Squaw Peak Road, and bushwhacking to Provo Peak. The lush vegetation often had the trail totally hidden as it tunneled under the green. 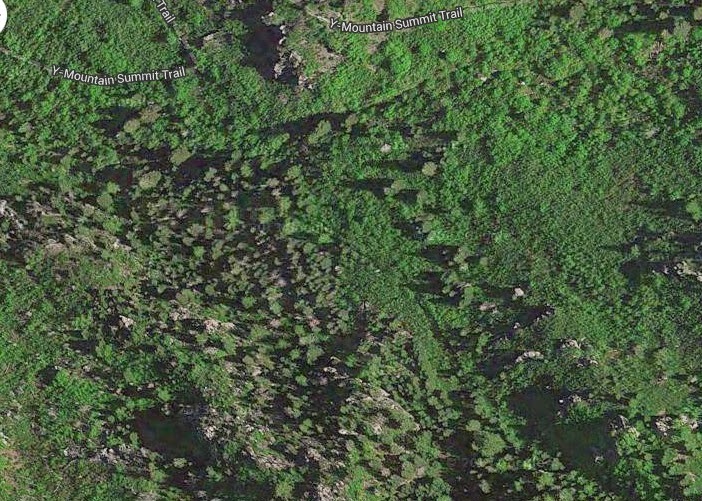 There was an old logging road that traversed around the mountain that I used years ago, but it was so hidden by vegetation that there was no point in trying to photograph it, but here is the map of the area, showing my SPOT Track where after resting I headed back down as I was almost out of water. A midst the vegetation is STINGING NETTLE, so watch out! Back down to the meadows...and looking back we see the ridge that comes off the back of Y-Mountain. It was up there where my oldest son, David, got his first buck, in thick fog,with my Browning lever action .243 I loaned him. He dragged him down to the highest house on the Provo foothills and called me to give him a ride. Looking up towards Maple Flats, I began looking for the trail. I had to find water soon, or head back. I just couldn’t remember where the trail took off and failed finding it. 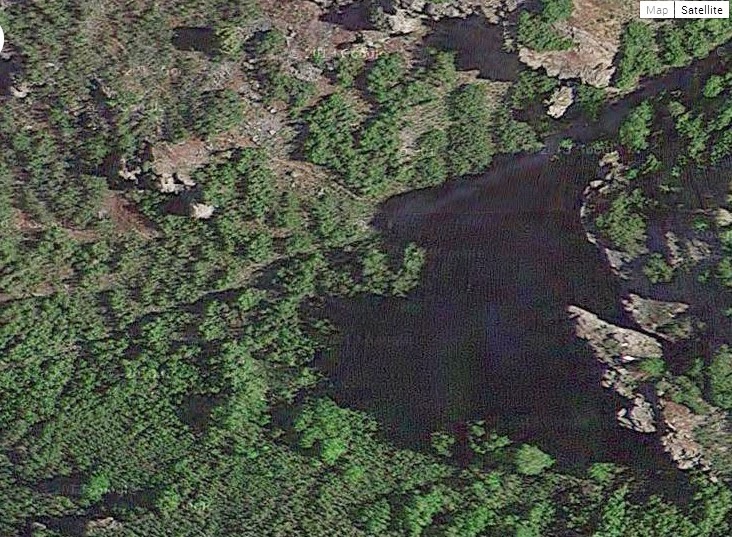 In my youth I would have just went bushwhacking and got there, but…..the mountain had grown bigger in 30-35 years. The spring was up there somewhere,  I since learned from my brother, Marlo, who had been up here in recent years, that on his last trip the spring was dry. I had brought a gallon of water, but was almost out, so headed back to civilization. 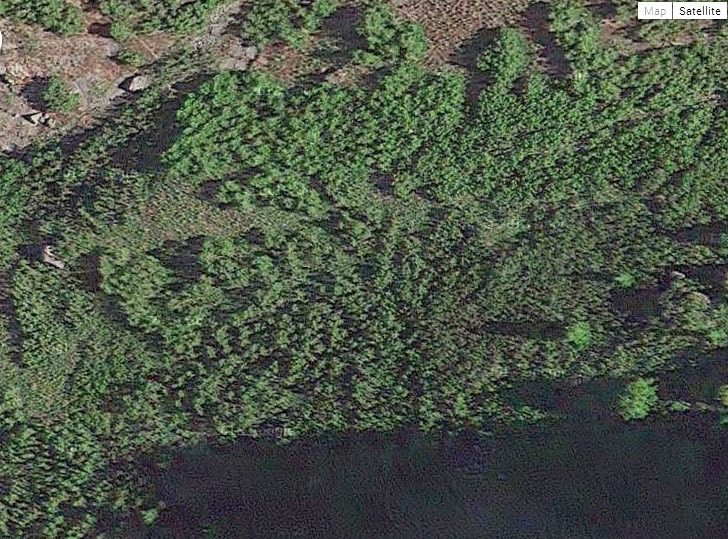 Since,  I did a Google Earth and Topographical map study with images that follow showing what I'm still determined to find and explore....IN A COUPLE OF DAYS. On my last hunt up there I got to Maple Flats that had spotty snow, and set up a bivouac camp. There was abundant straw from the tall grass and I made a thick mat of it and laid down my sleeping bag under the stars. At around 11:00 PM I was shocked to a sitting position by reverberating echos off Maple Mountain of a howling pack of coyotes that seemed to surround me! There was a good moon, so I just laid my .243 Browning across my waist and laid back down.. The trail was just 10 yards below me. 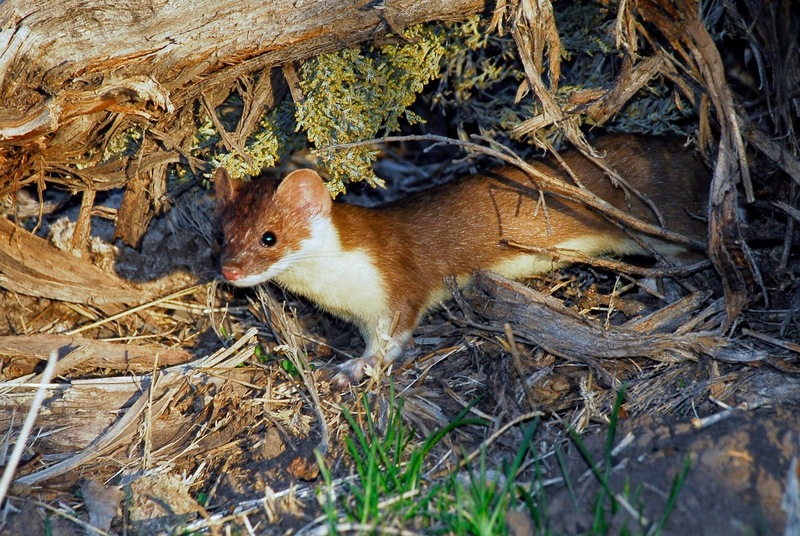 Soon I heard them coming by, sat up and squeezed off a shot at a big shadow that trailed last. There was a yelp….and then I heard him struggling, circling around me…and he stopped. Soon the howling returned echoing off the mountains, but a much subdued, quieter, and sort of lorn-full chorus. Apparently there would be an opportunity for another male to take over the pack. In the morning I found him 30 yards from my camp, and in the process of skinning him out, David showed up to see how I had done. The mounted coyote was with me down in Guatemala for nearly 20 years. Now, no room for him in my tiny Cabin A trailer, so he's  on my son Nephi's wall. Had great memories on my hike! What is ahead of me this week? In a couple of days I'll leave even earlier and head back up there with more water, and tough energy supplements and see if I can't get the task accomplished. 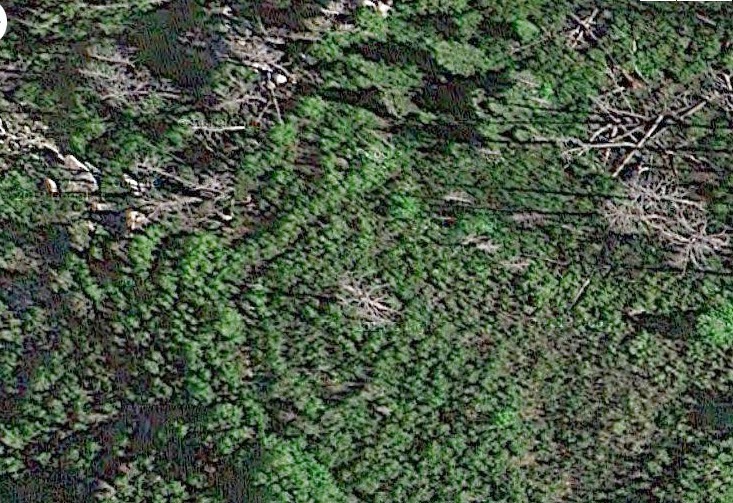 Following are Google Earth views showing what I'm looking for. Below  in shadows it's  hard or impossible to see...just a little top right. It begins to appear faintly as we proceed down the mountain. It becomes very distinct again. Further down it disappears again on Google Earth. This view taken in the Fall of 2012 it is seen quite distinctly near the foot of the mountain approximately in the vicinity seen below on Google Earth.. 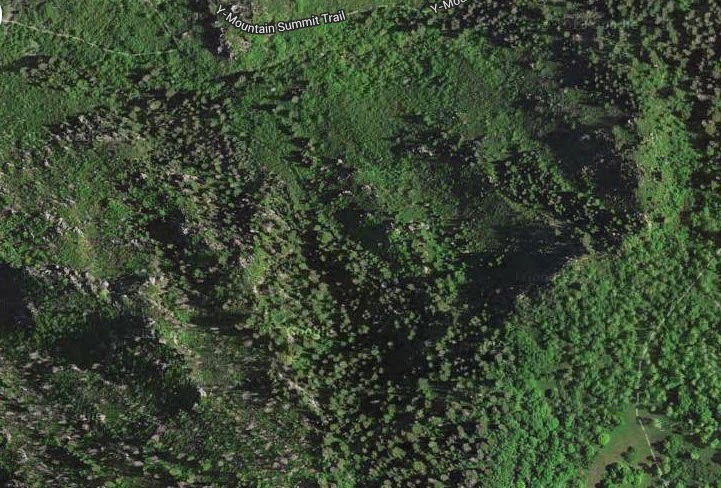 It ends in this vicinity along Provo’s foothills. 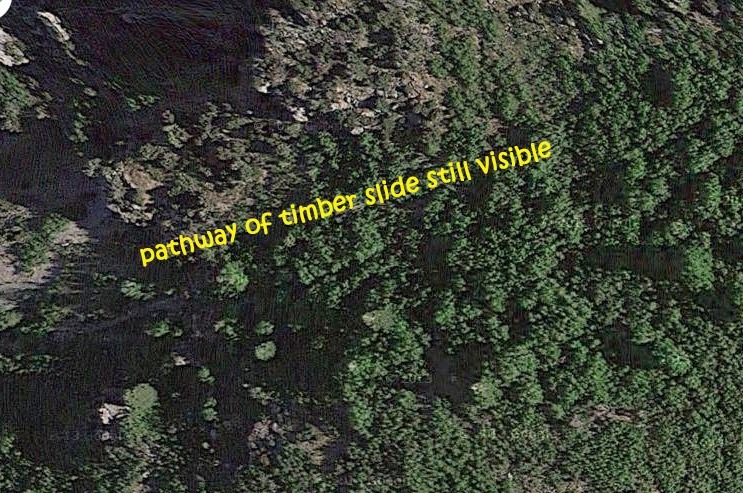 Below is an enlargement of the beginning up near Maple Flats of the slide pathway area. It shows some roadways, or ditch-like structures that need to be explored. 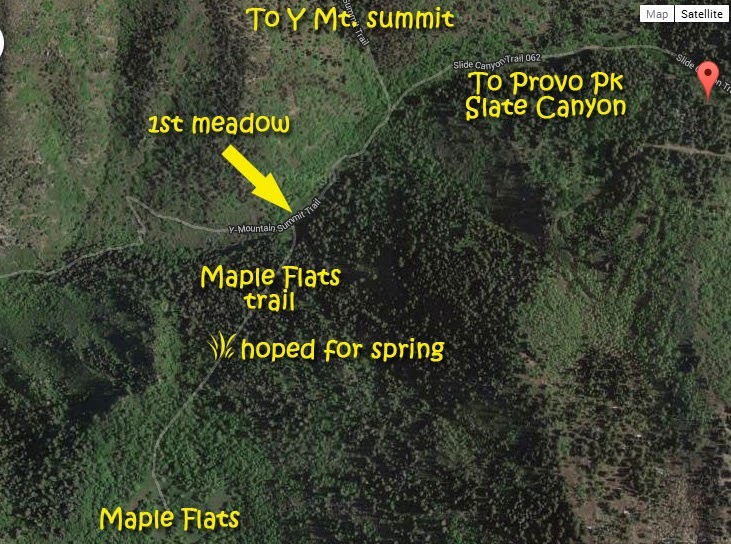 Likewise there is another pathway coming out of large trees to the northwest of the end of the Maple Flats trail as seen below in dead center.These would be descending into the steep ravine. 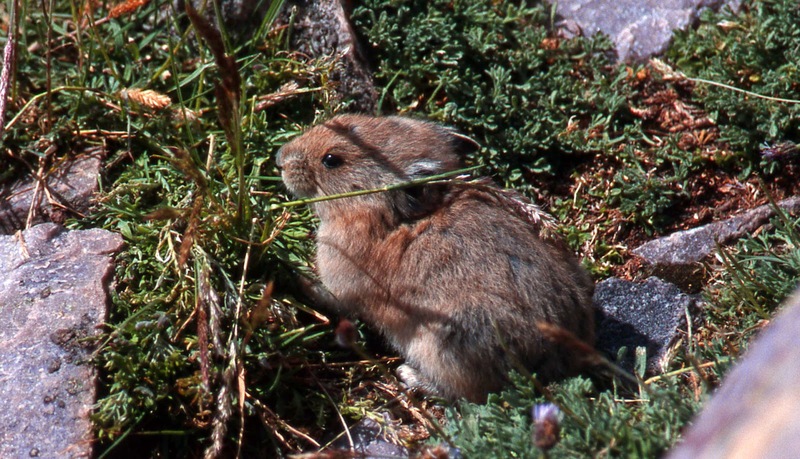 They go down the ravine, disappear in shadows and rough areas, and then reappear in the lower section as seen below. I’m likely biting off much more than I can chew….and hope some young archaeologist will take up the interest. It would be a fascinating study for someone–in the meantime I’ll be considered the expert on Google Search…see what I mean below. I headed back towards the valley with less than 20 oz. of water left. Between the Y and the Trailhead, some hikers first congratulated me for being a good backpacker, but apparently I looked pretty bad so they offered me some needed  water and kindly gave me 3 slurps from their water bottle. On arriving at the car I didn't have intentions of trying it again.....but after a couple of days I'm determined to give it one more try. I'll post the SPOT Tracker link and when that attempt will be, on Thursday, July 31st . But what am I  associated with? …..but before you laugh too much about my life…..remember that …. I had too much to do today and got a late start heading up the Y-Mountain trail at around 2:30 PM with temperature at 104 degrees F. I did a mile or so with 1,000 ft. elevation gain and even drinking some water started feeling a bit light headed. Then it got interesting for this old guy…I started feeling like I didn’t weigh anything and my spirit was floating away from my body! So I let wisdom take over and I “chickened out” and headed down the mountain. 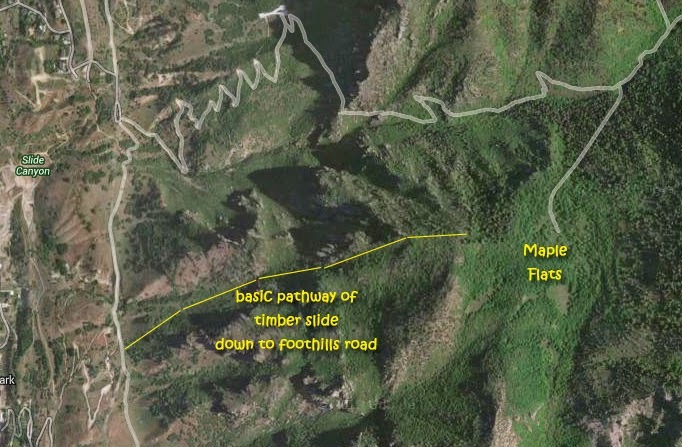 I will leave that one SPOT track there and on Friday at around 6:00 AM start up the mountain and see if that works better….and able to keep my spirit from separating from my body! If all goes well I’ll hit the OK button at the Y, then at Eagle Pass, next at the spring half-way up to Maple Flats (there better be water there or I’ll be in trouble), then at Maple Flats where I’ll set up a camp–about where I was camped back in the 80’s when surrounded by echoing howls from a pack of coyotes (and by the light of the moon I got the big one), then when I begin locating remnants of the pioneer timber slide, I’ll hit the OK at key points as I explore the pathway down to the foothills, hoping to find remnants and artefacts….like square nails, etc. 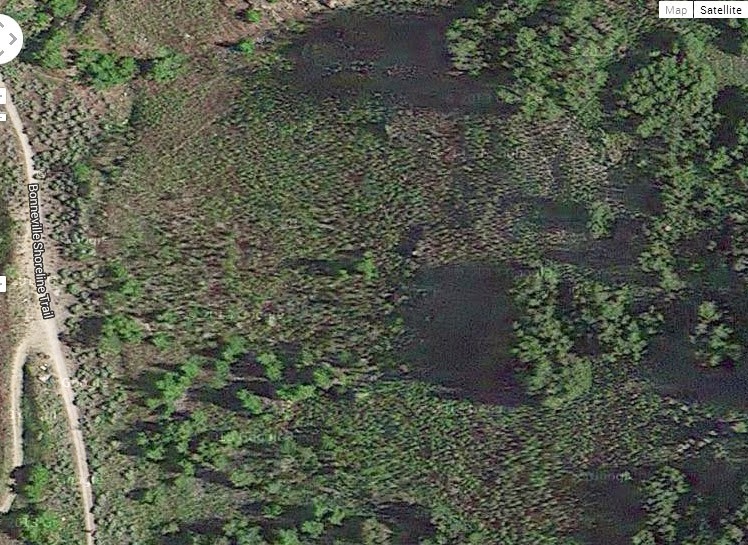 This is where I used to hunt deer, backpacking in, and I never failed at getting my buck, until the last hunt when I got a coyote. …….. east of Provo hiked to keep in shape and had an incredible experience in this magnificent canyon with all its natural & human wonders! This is where in my youth I would hunt cottontail rabbits and had great adventures. 6 MILES IN 6 MINUTES of VISIONS OF NATURE! 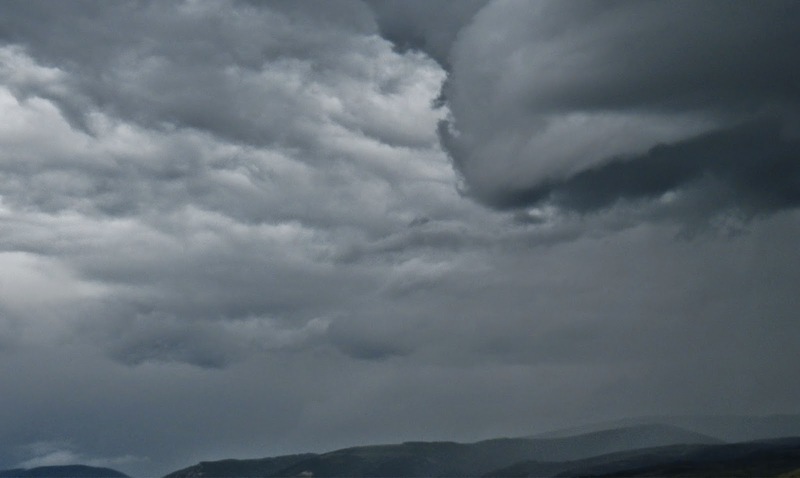 As I headed east towards the High Uintas the weather looked ominous….except for a double rainbow. Was it a sign? Meaning what? From American Fork it was like 88 miles following the Mirror Lake Scenic Byway to the North Fork Road, then a couple more miles to this sign where you go another few miles to the East Fork of Bear River Trailhead….100 miles from American fork. Check out on the YouTube video some close-ups of the great GMC pickup from Nevada that looks like a Power Wagon. It will also have overall shots of most flowers & plants, and then close-ups. The whole area was a wonderful wildflower garden…even before getting to the Register…In this photos/essay I’ll identify most of the flowers for those who might be interested….hope there are a few because it is a painstaking effort to do so. Reconnaissance Lake & Triangle Mt. inserted here to show a lake as mentioned in VISIONS OF GLORY. I expected no less on my attempt to get to Lake Lorena….how wrong could I have been? At the Trailhead the Forest Service has this display and description of the East Fork Fire from 2002, and an explanation of the Interpretive Trail that starts here and is 1/4 mile long. 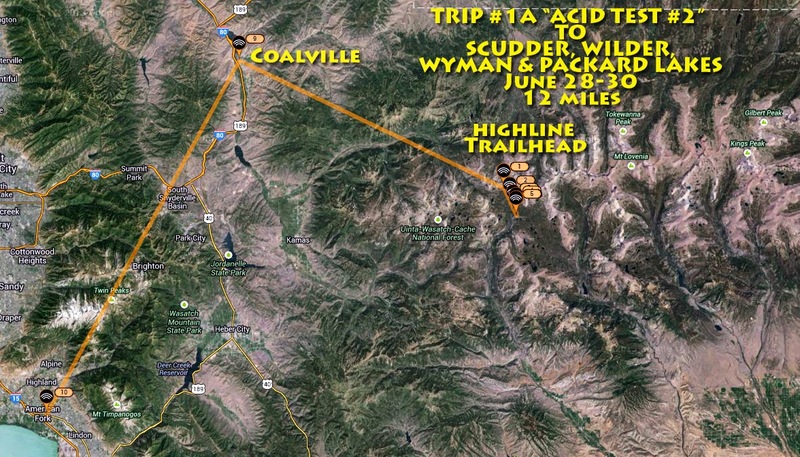 You should zoom in and read about this event, evidence of which you will see during the entire backpack. 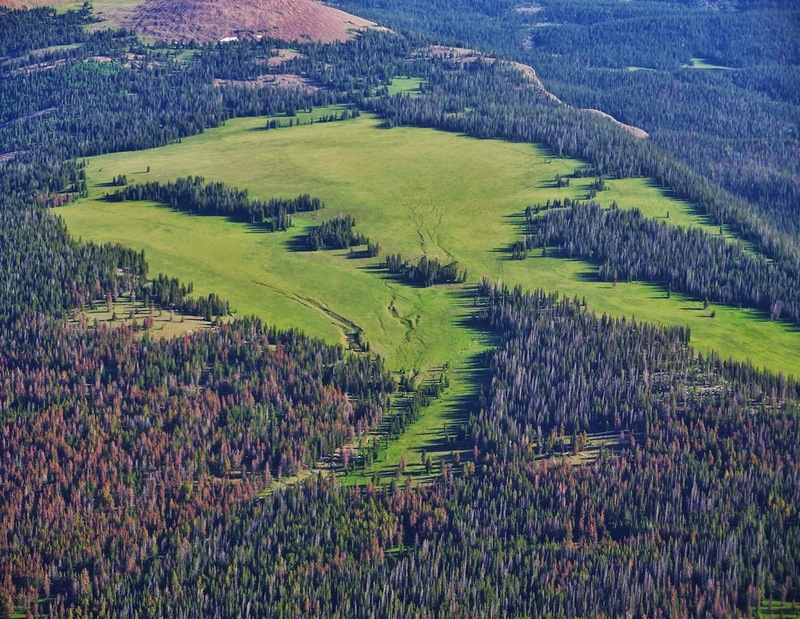 Covering the mountainsides is the dead timber from the fire, but notice the green vegetation and colorful flowers that carpet the forest floor….bringing back to life the area. Foremost among the green carpet is the new “Queen of Utah’s Trees,” the QUAKING ASPEN, since 2014 the Utah State Tree.. 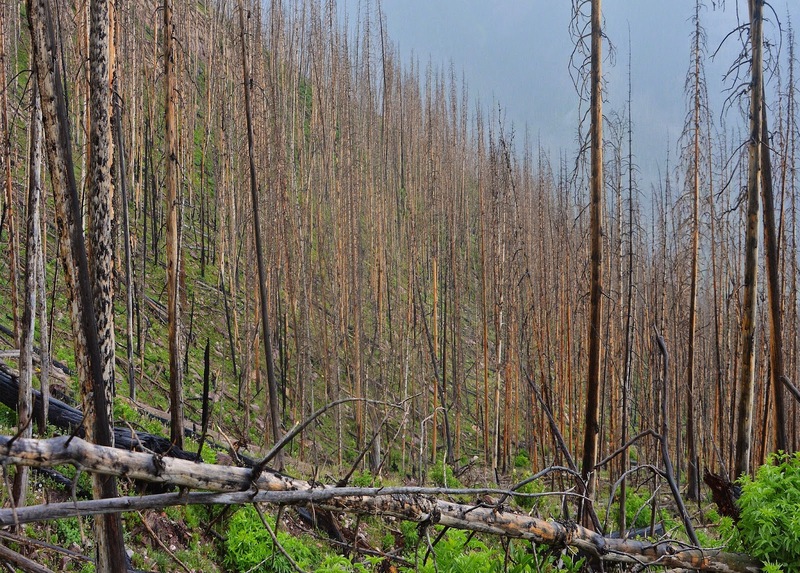 The Quaking Aspen propagates through its root system that usually survives a forest fire and very quickly sends up sprouts to save the forest. There are good reasons why the Aspen is now the “Queen” of Utah’s trees. I say “Queen” as it is delicately beautiful, but resilent and a wonderful “helpmeet” for the tough “manly” mountains. In the humid areas all kinds of wildflower are seen in addition to the Bluebell. Like the tall, long stemmed Monkshood. The North Slope Highline Trail. Native cutthroat trout from Allsop Lake. The Cathedral is in the background. Thanks for including us in your blog….we made it up to Allsop, and the rain started in earnest right about the time we arrived. We had to reconfigure camp a couple of times as the thunderstorms moved through to find drier ground to set the tarp over. We found a good spot in the trees and got bedded down, but not before getting pretty well soaked. Got dry and slept great even with the weather. The next day, caught a few of the native cutthroat that you told us about. The fishing was really good! 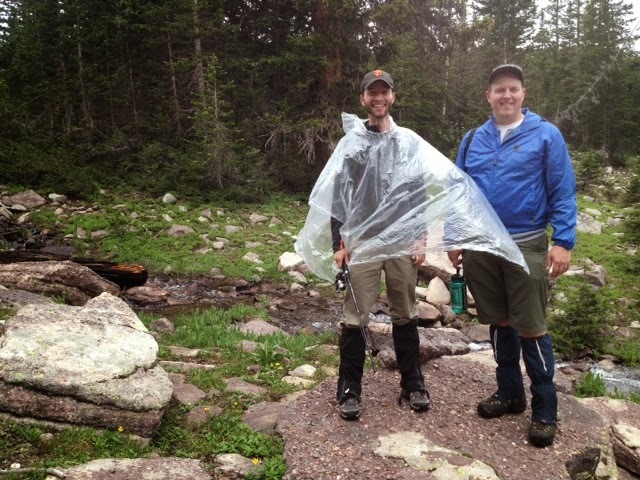 Rather than try to make it up and over to Priord lake, we hiked back down (through the other couple of heavy storms) to the East Fork Bear River Trailhead, and decided to call it a trip. We headed up to Evanston and had a big dinner :^). It was a great time, with great scenery, and we’ll definitely visit again. Wild strawberry leaves….saw no flowers yet as seen in Lakefork. Coming down to the East Fork of the Bear River. The Bear River has the distinction of being the longest river in the hemisphere–500 miles long– that doesn’t empty into an ocean. It begins in the High Hintas, flows north into Wyoming, swings west making a loop through Idaho, and then flows back into Utah emptying into the Great Salt Lake. Not identified…yet… tiny flower….number 318 photographed so far from the foothills to Kings Peak. Zooming in on the very tiny flower…perhaps 1/8th of an inch in diameter or smaller. The trail crews are doing a great job–thanks to Bernard Asay, Trail Supervisor for the Forest Service out of the Evanston Office. I’ll insert his picture below. Notice the leaves, compared to dandelions, two pictures down. Tie hacker stumps from the early period–1867-1880. About 2 miles from the Trailhead, there is a series of 4-5 ruins from the tie hackers. Round nails weren’t invented until 1910, which are the ones found in all the ruins, so the ruins are from the 1912-1940 period. The early period ruins have square nails, are smaller, and don’t have smooth interiors as all of these ruins do. A fairly large tree grows inside one large ruin….which has one assuming that the tree is as old as 100 years. Early period cabins have signs of rock fireplaces, but this remnant of a wood burning stove further designates these sites as from the latter period. This outhouse and garbage hole likewise identifies this site as from the latter period. In the early period garbage was just thrown out the door accumulating in front of the small cabins, and I’ve never found an outhouse hole in sites from the early period. A stovepipe further confirms our aging of the site. More stumps very rotted away are from the older period. Further investigation would be required to understand the full historical picture. Finding safe ford of the Bear River where it broadens out and reduces the depth and strength of the current. Good strong pole in hand and wadding slippers on I’m ready to cross the stream…carefully. Just in case, my camera and lenses are safely sealed in gallon sized Ziploc bags. My topographical map indicates approximately where the crossing will be made…and from there begin bushwacking up the steep side of the canyon. Here and there in the burned out area conifers are also seen coming up. 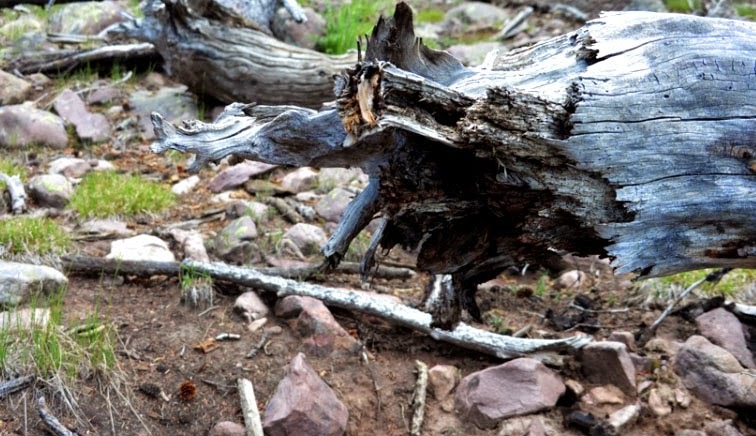 It was slow going up the very steep mountain detouring constantly around downed timber. The FIREWEED–Epilobium angustifolium–plant is springing up all over, and later on will look like what we see below. The rain, threatening all day, begins to come down. I put my poncho on covering me, photography equipment and backpack, and waited. It slowed a time or two, but then kept coming down harder and the temperature dropped. Just with a short-sleeved T-shirt and short pants, I soon began to chill and realized I had to get on more protection. A lull in the storm let me quickly get pack off, find a long-sleeved shirt, rain parka, and rain pants, then with backpack on my back again, got my poncho back on and felt safe. 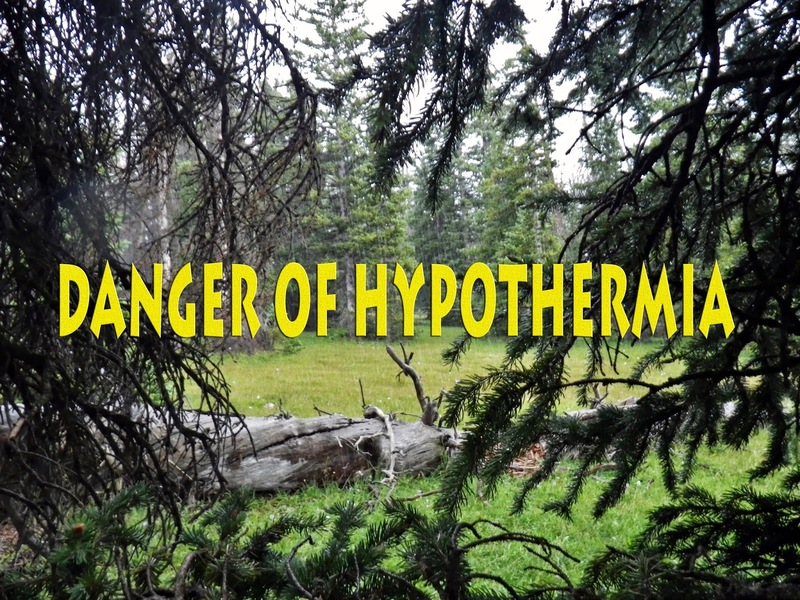 The three “killers” in the High Uintas are: Hypothermia, lightning, and High Altitude Sickness. One has to be prepared to survive all three. As the monsoon persisted, now approaching 7:00 PM, I had to become concerned about finding a flat piece of real estate to set up my tent to get through the night. I could see up above me what looked like the top of the hill where I would hopefully be able to set up a camp. It worked and soon, with rain still coming down, I had to get my tent set up. I covered my photo equipment and backpack with my poncho, and hustled to set up my tent. Luckily I was protected with rain parka and rain pants as I did so, but still only one thing is worse than trying to set up a camp in the rain–that being, to have to pack up wet equipment in the rain. Finally it was done. 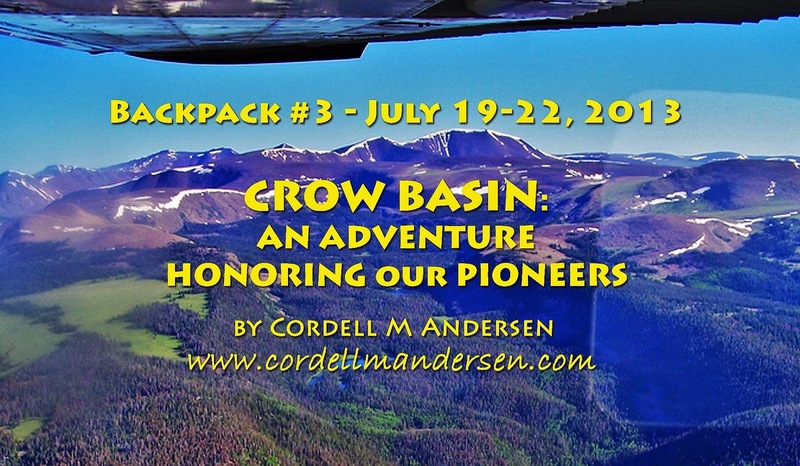 I put my backpack in the vestibule area, and threw everything else inside and jumped in head first…..a bit of a problem as in my small one man tent it is almost impossible to get turned around inside. It was CHAOS inside my tent, but I had got it done and was safe. No cooked dinner that night. Luckily I had filled my water container and was able to use one of my lunches that just needed water. In the morning I waited for the sun to hit me and begin drying everything so I could continue….but it never happened, and finally I opened the vestibule to see a cloudy day. My experience had me believing that when a day begins that way in the High Uintas, the day would just get worse from there on, so decided it wise for me to pack up and head down. I just hoped that Mother Nature would hold off the storm until I was at least packed up. I had made about 1,000 ft. in elevation gain with about 600 ft. to go, but quite frankly I was worn out and didn’t want to put myself in a situation of greater risk. So I hit my SPOT Tracker OK button, and began preparing to break camp. 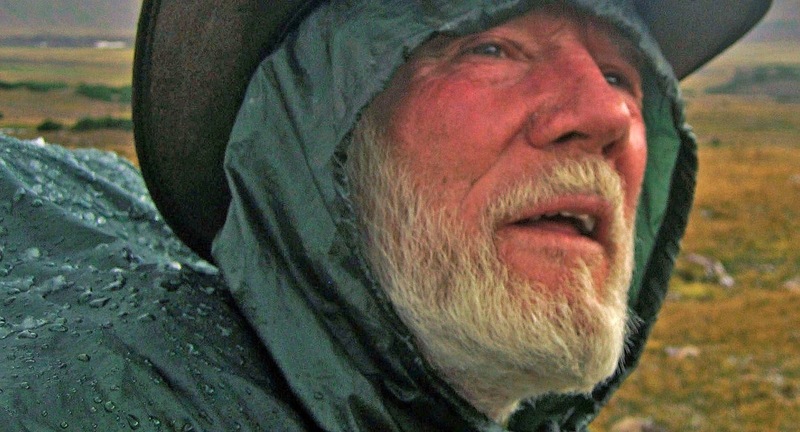 It was Kevin Rogers, who led a group of 7 who had struggled into the area during the downpour the night before and 50 yards off set up their tents. Kevin’s cell phone picture….as I have heard from him, added more pictures further along, and have the promise of more pictures soon. Once packed up I dropped by to meet my 7 new “HIGH UINTA FRIENDS,” who were gathered around a campfire trying to dry out all their stuff. Some of them knew me from my website, and had decided to one way or another get to LAKE LORENA. Kevin for years had been a professional guide, but admitted that this was one remote area that had escaped him, as it had me. I joked with them about my several “FOREST GUMP MOMENTS,” and admitted that I was again possibly facing one of those times….even though admitting that each time, after surviving, recovery, and a Big Mac & Mountain Dew, I became determiend to “NOT GIVE IN” yet! I think I mentioned learning about the “tie hackers,” being “unsung American heroes without whom the West might not have been won,” and “the liveliest if not the most wicked town in America!” but then launched myself into my two BIG FOOT experiences from 2013. Describing when coming down Little East Fork of Blacks Fork, when all of a sudden stopping to rest…….Big Foot appeared and we tried to communicate using gestures…..
Then his son appeared on horseback….and I recalled a couple of years ago that a sheep herder in the area had lost a horse, and it occurred to me that is why we don’t see footprints of Little Foot since he’s on horseback. Then they began sort of making fun of us humans who need REI backpacks, and Golite sleeping bags, and Big Agnes tents to survive in the Uintas, etc. Then they turned and headed into the forest. All the time I was trying to manipulate my camera that I had set on a rock, hoping to get some photographs, and even video. But, once they were leaving I went for the camera to make sure I was getting something, but knocked it off the rock, and the clutter of it falling….WOKE ME UP….FROM THE DREAM! The fall actually broke my skylight filter…saving the lens, and I checked to see if maybe I had got some pictures from what was maybe….a real experience? But, no luck! It was just a dream, I told them, but…..maybe like the prophets of old…it was a VISION IN A DREAM giving me the idea that maybe there was something to the legend and I should keep an open mind. I went down the trail with camera ready as always…..and then all of a sudden ….. HE CAME CRASHING THROUGH THE TREES…..AND HAD A RED T-SHIRT ON! 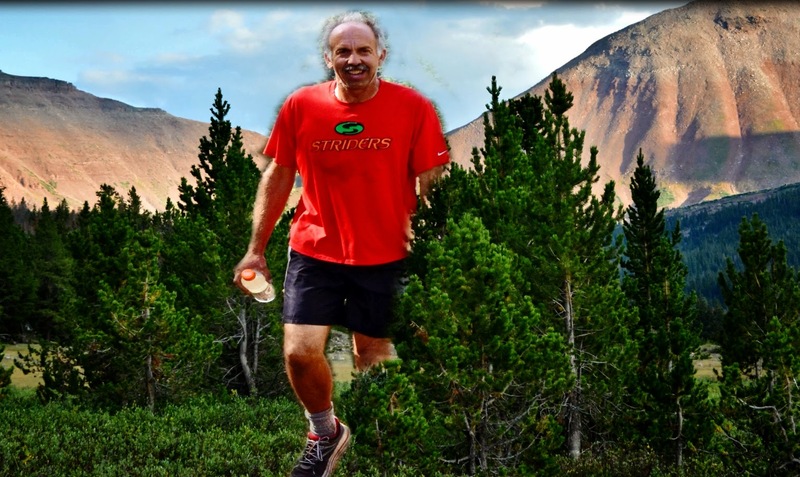 Back to reality…..I found it was ROB WILCOX, mountain runner, heading for Squaw Pass. I told him about the dream I had just had…..and caught him expressing….. 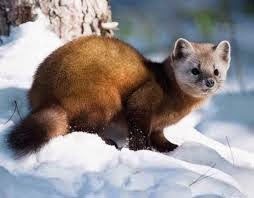 Seeing a PINE MARTEN that came into our camp checking everything out, but didn’t have my camera in hand to get a shot. 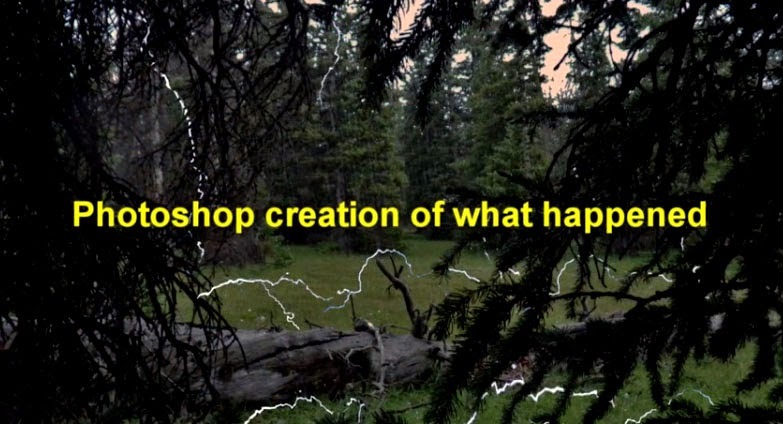 I was caught along the escarpment of upper Crow Basin in a rain storm, when attempting to throw my poncho up over my backpack lost my balance, fell backwards over a huge fallen tree catching my left foot in the roots and left hanging there with my whole load, convinced my ankle was broken. Finally wiggled out of my load, pulled myself up and was alright. I got my poncho on, and moved up to the edge of Jackson Park with rain pouring down, then the lightning hit and got real close. ……..and WAVY WISPS OF ELECTRICITY DANCED ALL AROUND ME! GREATEST EXPERIENCE IN THE OUTDOORS! So far I haven’t heard from them. Glad you made it out ok! The weather held out long enough for us to get to the lake but my camera (phone) kinda died from all the rain. Rich (my friend in the orange fleece) took a bunch of photos. I have copied him on this email. Hopefully he’ll send you a few. It was great to meet you and talk with you for a while. Great to hear from you. I do have quite a few pictures and some good ones of Lake Lorena. I will get them off my phone and send them to you soon. Thanks for the fun stories. 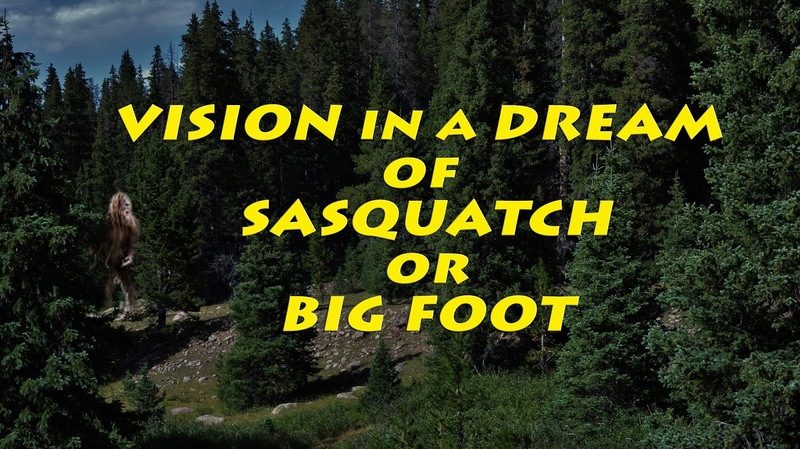 Good luck on your next encounter with big foot! The fishing was horrid. In fact, my brother who was there with us is a Hydrologist and wanted to take samples of the water. We saw no evidence of fish (other than dead ones) for 2 hours and he speculates an anoxic or hypoxic (they’re effectively the same thing) event took place in the lake over the winter due to the presence of algae on the bottom of the lake. Either that or the storm scared the fish into a deep hole. Nevertheless, it didn’t make up for a rough night! We left around 3 after another deluge that lasted from 2-3pm which was much more severe in volume and intensity. One strike (lightning) hit above camp not more than 300 yards away (simultaneous flash & thunder). Thankfully, the weather subsided for the hike out and by the time we hit the trailhead, the sky was 60% blue. Go figure! Now I’ll continue telling the experience of going down to the river and back to the Trailhead. I knew as I started down the steep, slippery slope that I couldn’t make a miss-step, so carefully I moved, zig-zagging all over the place to get around downed timber. Here’s the whole plant that you should recognize from its leaves….the monsoon caused the fluffy seed heads to become almost unrecognizable. I finally made it to the river that had risen due to the rains, and I couldn’t find my ford. I finally found this log jam on the river and carefully made it across, only wishing I had with me a machete to clear out the branches that made it more difficult . All the way the clouds were threatening….with drops falling at times, and then it started building. Then with a BANG another monsoon broke loose, and I said a prayer for my friends up on the mountain……and hurried along towards the safety of the Trailhead and my little Cabin A trailer. 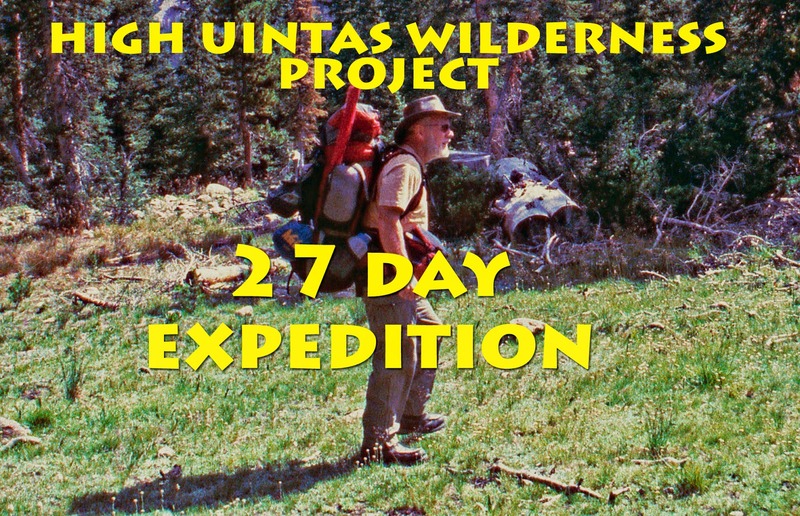 A thorny THISTLE had me thinking about my nearly 1,700 miles of exploring the Uintas, and had me concluding that in my 79th year I had to get my priorities straight and move on to the remaining phases of my HIGH UINTAS WILDERNESS PROJECT. I know myself well enough to realize my backpacking days aren’t over with–as quite frankly I have gratefully been able to do better than I would have ever imagined possible just 18 months ago when it looked like I was a cripple, but the reality is that I have got to move on to the concluding phases of my project before it’s too late. I’ll have to admit that failing at doing my DREAM LIST OF BACKPACKS has an interesting humanizing and humbling effect on me….that is a relief….. lightening my load, and opening up the way to finally finish what I vowed I would do 62 years ago–share what I vowed to learn about the High Uintas with as many as I could reach. As is happening already, my DREAM LIST OF BACKPACKS is blessing the lives of younger adventurers who can complete them all–and be blessed in the process. 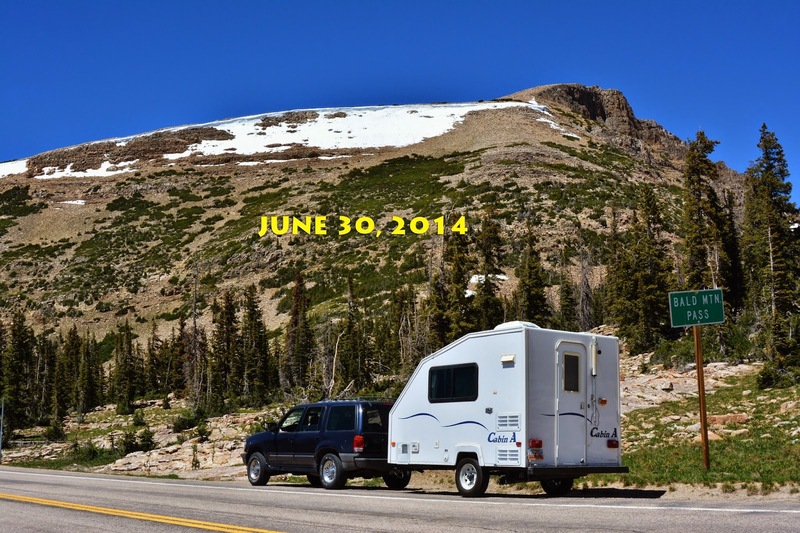 At this writing I’ve already heard from several High Uinta Friends who soon will be heading for high adventure….getting to LAKE LORENA. I just hope it won’t get too congested! As I drove down the canyon I turned to bid farewell to Mt. Beulah, grateful for the wonderful experiences the Creator has blessed me with in these incredible mountains that have blessed my life in so many ways…..and for the opportunities of sharing my experience with hundreds and thousands from all over….some of them thanking me for literally “SAVING” their lives through my frank sharing of experience and my suggestions how to go into the Wilderness safely. I stopped near Bald Mt. Pass to take a last shot of Hayden Peak & Mt. Agassiz, grateful for Ferdinand Hayden, and Louis Agassiz, and others like them, who over a century ago paved the way for all of us to be blessed by this wonderful Wilderness. A wonderful spot as the sign indicates, the drainage to the east being part of what becomes the Green & Colorado Rivers, fed by most of the streams from the North & South Slopes that drain into the Pacific Ocean, and the Provo River to the west draining into the Great Salt Lake, along with the Weber, and Bear Rivers–ALL OF WHICH, NORTH & SOUTH, EAST & WEST, CONTRIBUTE 90% OF UTAH’S WATER! 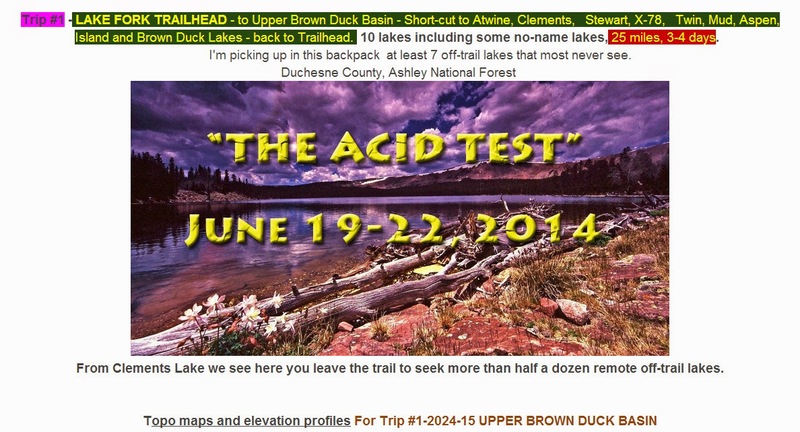 Trip #1 REPORT: The “ACID TEST” To East Brown Duck Basin….Success? Future? This will happen from Thursday, July 10th to Saturday, July 12th–UNLESS THE WEATHER REPORT HAS ME SHIFT IT A FEW DAYS…it looks sketchy but I will try and be on the trail Thursday morning…if you get a SPOT track “OK” that means I’m on the trail……. 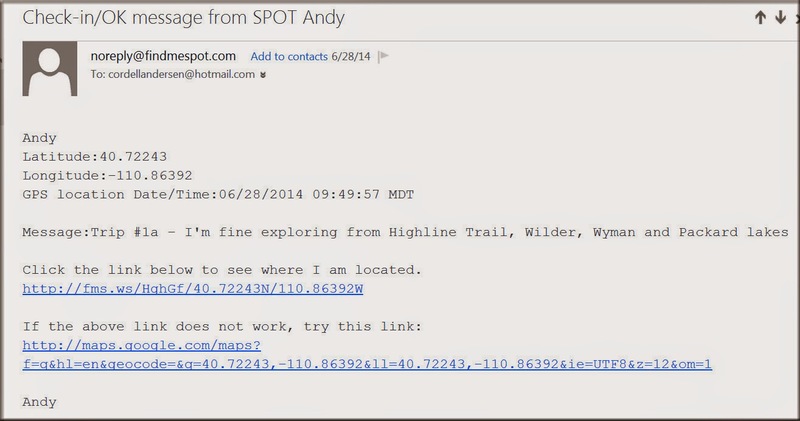 the SPOT link will appear here on Wednesday, July 9th. In spite of ominous weather I made the effort to get to LAKE LORENA, had an incredible experience…even though kicking and screaming, scratched & scared…. I failed to get to the finish line…yet had WONDERFUL SUCCESS! a complete photo version in a YouTube Video without narration. For details click on the Dream List above. PREPARATION: I’ll have to admit getting hooked on the World Cup, even though the U.S. was eliminated…..so I want to be around for the games on Tuesday & Wednesday–then immediately on termination of that game leave for the East Fork of the Bear River Trailhead to sleep Wednesday night there and get an early start on Thursday for LAKE LORENA. I know that Dave Cawley beat me to it last week (see KSL Outdoor Radio Facebook page) but he didn’t test the fishing, and I have plans for unique photographs that I can’t rest until attempted. 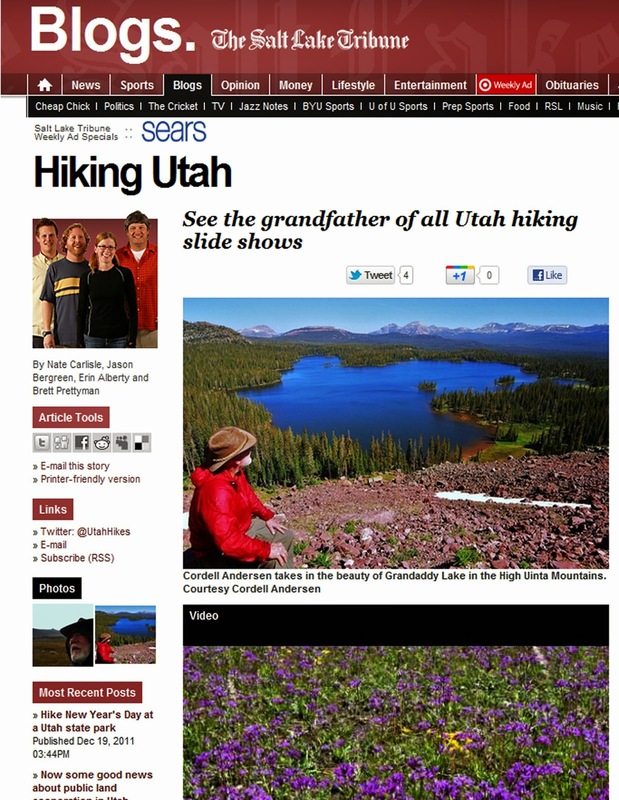 NOTE: KSL Outdoors Radio seemed to indicate that Dave discovered this isolated Jewel through my website. The hike’s elevation gain was misunderstood on the program indicating it was something like 3,500 ft. but it is rather 1,662 ft. in the 4 mile hike. The trailhead’s elevation is about 9,130 ft. from which you drop down a couple of hundred feet then climb 1,662 ft. to the lake at 10,562 ft. NOTE: To get the whole story with many details like, names, elevations, distances & jokes– read the captions that will take you maybe 20 minutes. To just focus on enlarged photos, click on the image below and see photos one by one. Backpack #1 had turned out to be difficult I believe due to the topical chemo treatment I had gone through over a period of almost 6 weeks prior to the trip which was supposed to have been according to the post below. I experienced a lot of fatigue and in that weakened condition when all of a sudden above 10,000 ft. began experiencing some symptoms of High Altitude Sickness, and was forced to go down, rather than continue even higher as planned. I even had thoughts again as Forest Gump had after running around the country for 3 years. 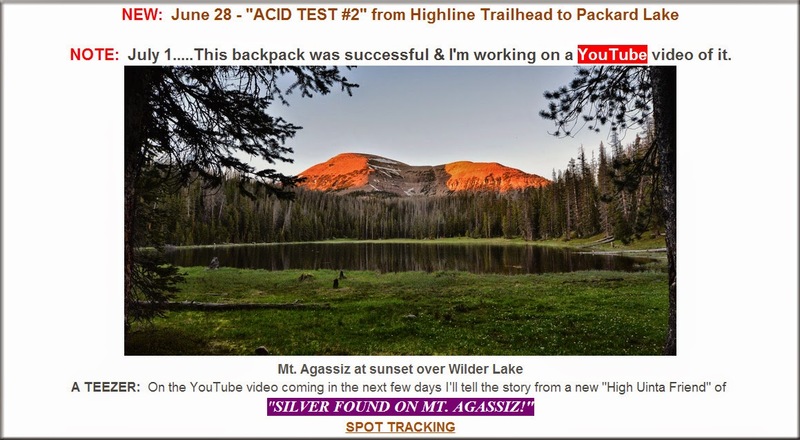 Yet, my challenge for years has been to “NOT GIVE IN…..EASILY” so I determined to keep at it making a 2nd backpack from the Highline Trailhead and do my darndest to build on what I achieved in my first trip. This one turned out to be successful resulting in the following post on my website. For unexplainable reasons I experienced difficulty doing the YouTube video announced above, so resorted to the following photo/essay. 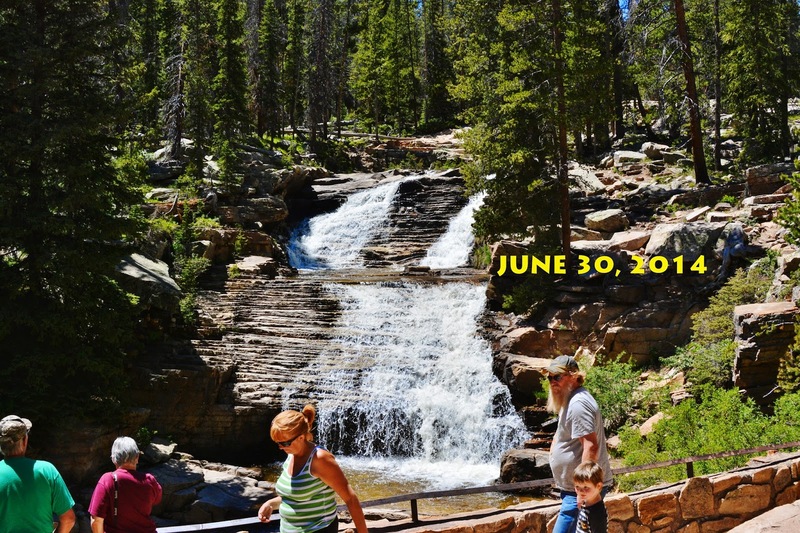 It began at the Highline Trailhead at 10,347 ft. altitude along the Mirror Lake Scenic Byway–Utah Highway 150, with Hayden Peak guarding the area. Hayden Peak is 12,479 ft. high and named after Ferdinand Hayden, an American geologist and surveyor who made pioneering surveying expeditions in the area in the late 19th century. Horse packers were seen preparing to go into the Wilderness. Among them were CORDELL & Candy Wolking, along with two friends, Brandson Farley and Nate Gardner….all of them together seen below. 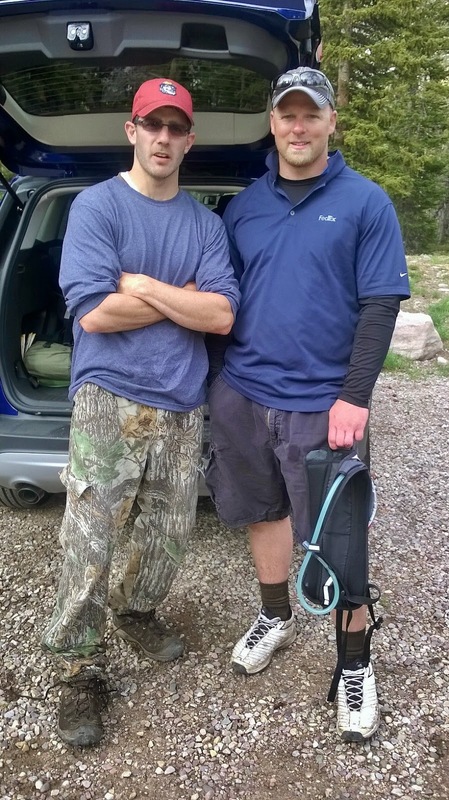 These two new High Uinta Friends, Jason Howes, and Danny Drake, had just returned to the trailhead having backpacked to Pinto Lake. They reported good fishing. 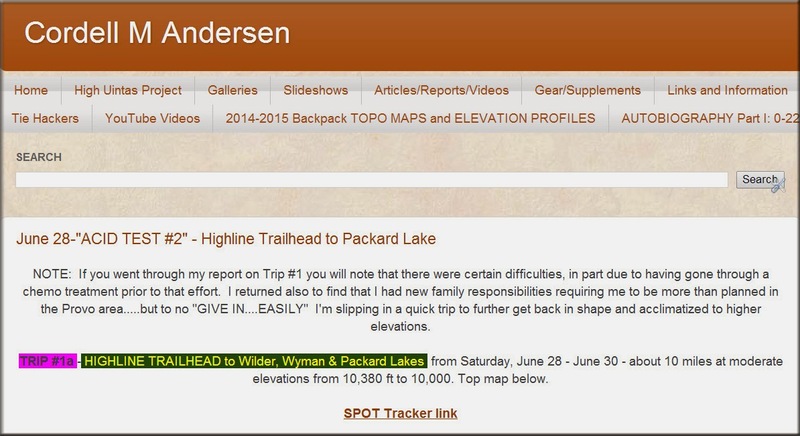 First point in backpacking safely…. Let family & friends know where you’re going. I had posted the day before the following on my website, along with the topographical map that showed the route I was going to take. My family, friends, and the whole world knew where I was going. 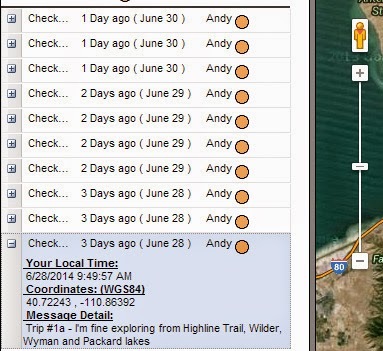 Have and use a SPOT Personal Satellite Tracker. I used it when I was ready to head down the trail hitting the OK button that emailed my prepared message to the 10 on my list letting them know I was on my way and exactly where that starting point was. 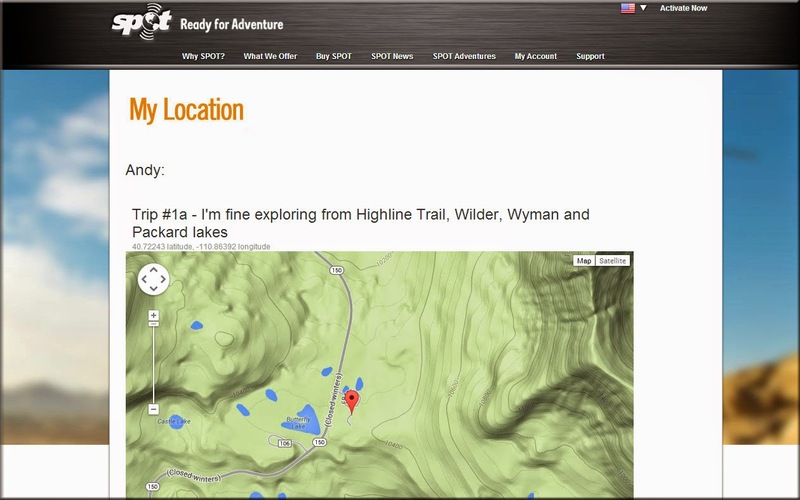 Prior to leaving for the mountains you program your SPOT Tracker using your computer with the name of your backpack, a short message, and 10 emails of friends, who will receive the OK message via email. Part of that message, seen below, is a link they can click on to instantly connect to Google Earth and see my exact location. My first OK is from the starting point. Also I put on my trip announcement, seen above, a link to the SPOT website where anyone interested can go everyday to see if I’m okay and see on Google Earth exactly where I am . One can see the location either using “map” mode, or “satellite” mode. Above is seen my beginning point at the Highline Trailhead in “map mode.” Other examples along the trail will be in “satellite mode” which is the Google Earth view. 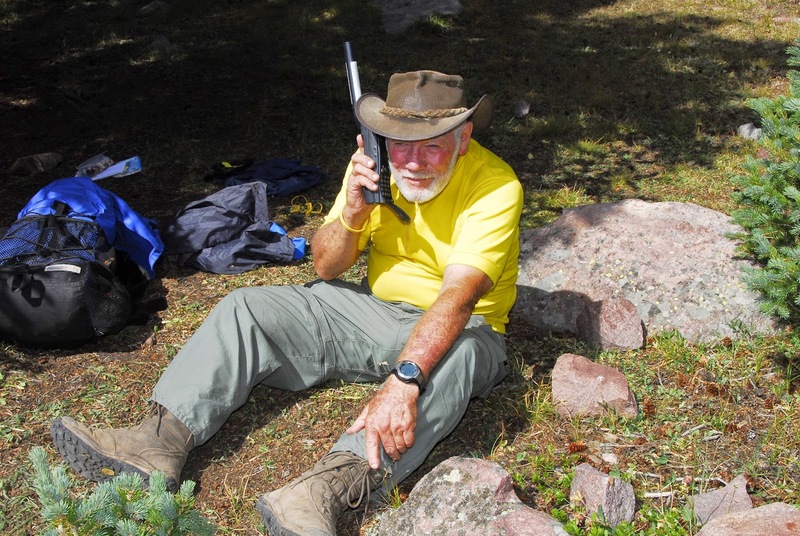 Third point in going into the Wilderness safely…..
Of course the sat phone as well as the SPOT Tracker can be used for emergencies. 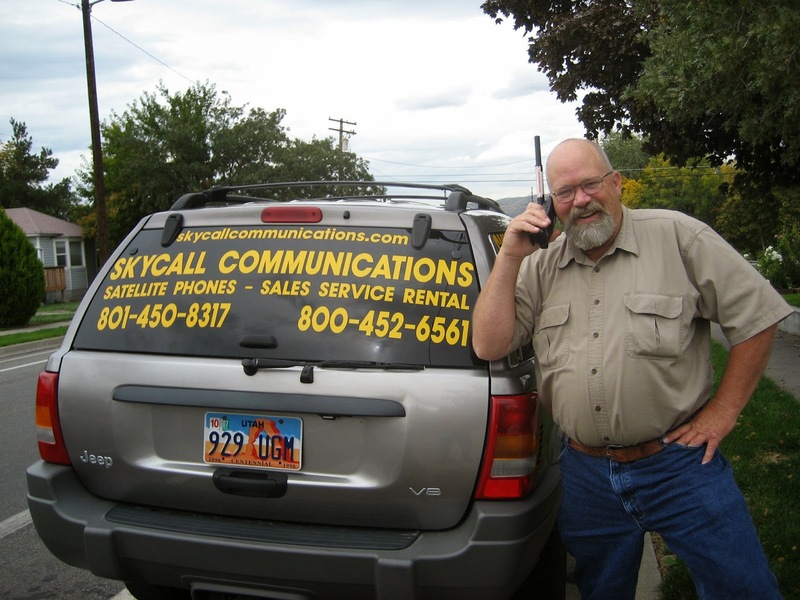 In my case, the sat phone, during my first 4 years of the High Uintas Wilderness Project, was only needed for emergencies twice–both with groups of Boy Scouts that had an injured boy. I loaned them my sat phone to call for help. Only once has it been necessary for my own need, which story I related in my speech at Coalville a few months ago. The photo below is outdated in the name of Russ’ business, but the phone numbers are the same. At the Trailhead I used the phone to give my weekly report to KSL OUTDOORS RADIO’s weekly Saturday morning program from 6:00 AM to 8:00 AM. Tim Hughes, the host of the show is seen above. 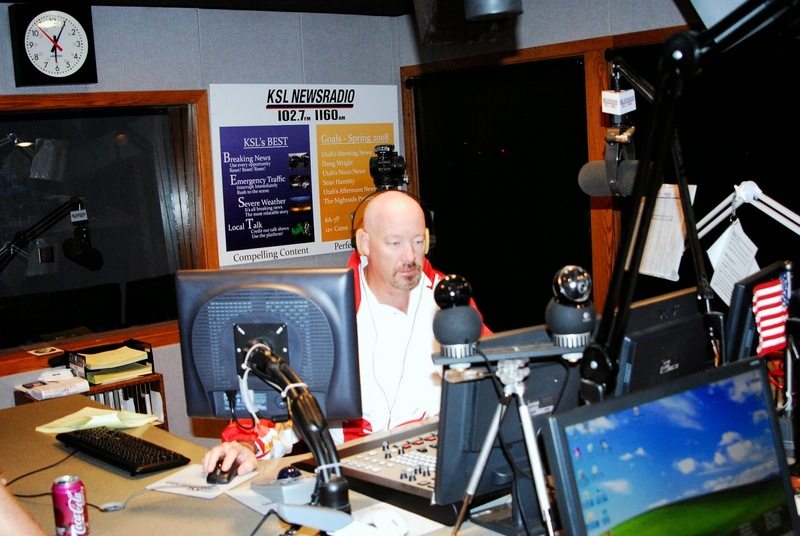 Russ Smith is his partner in the weekly radio program. I was finally ready to get on the trail, but first had to register with the Forest Service. I’ll insert below shots of the register to June 18th. You might find a friend there….but it is interesting to see where people are going, and how early backpacking got started this year. 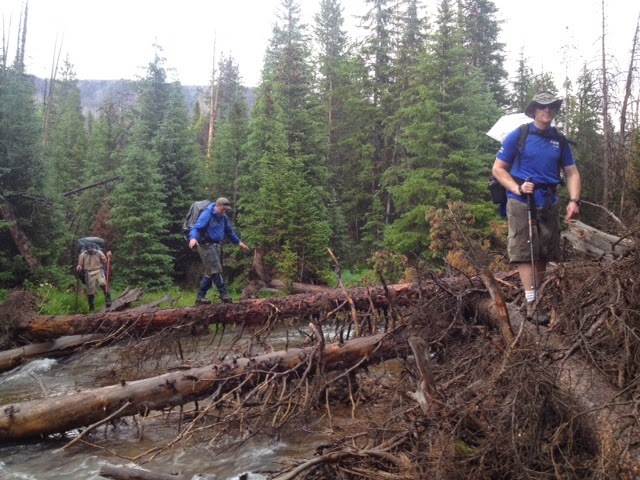 ...where we can see that the trail crews are on the ball having cleared downed timber. Heart Leaf Arnica leaves are everywhere in the shady forest….but no flowers yet as was the case in the area of my first trip on the Brown Duck Basin Trail where their beautiful yellow flowers decorated the forest floor everywhere. 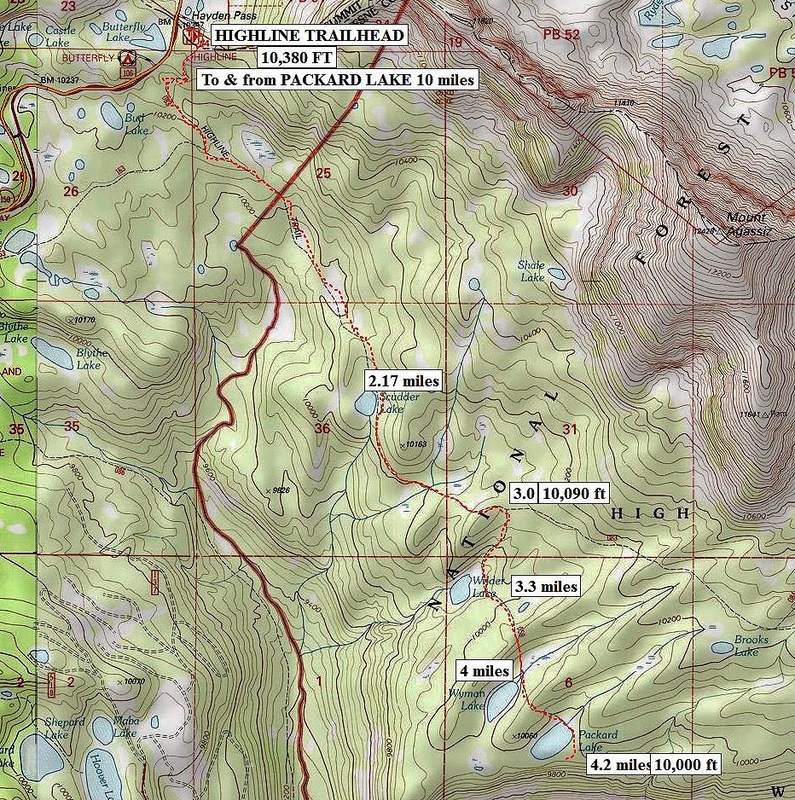 Part of the difference is that the Lake Fork Trailhead is at 8,000 ft.–2,347 feet lower than the Highline Trailhead at 10,347 ft….the highest Trailhead in the High Uintas. White Globe Flower among the first to bloom. The Marsh Marigold flower is similar to the White Globe Flower, but the leaves are totally different. It is always one of the first wildflowers to decorate the humid areas. More new High Uinta Friends are the Wilsons: Chris & Carol, daughter Kayla, along with “ASLAN,” the Tibetian Mastiff breed dog that Chris brought back from Mongolia where he worked for a time on a service project. Soon we come to a junction where a trail from Mirror Lake joins the Highline Trail. 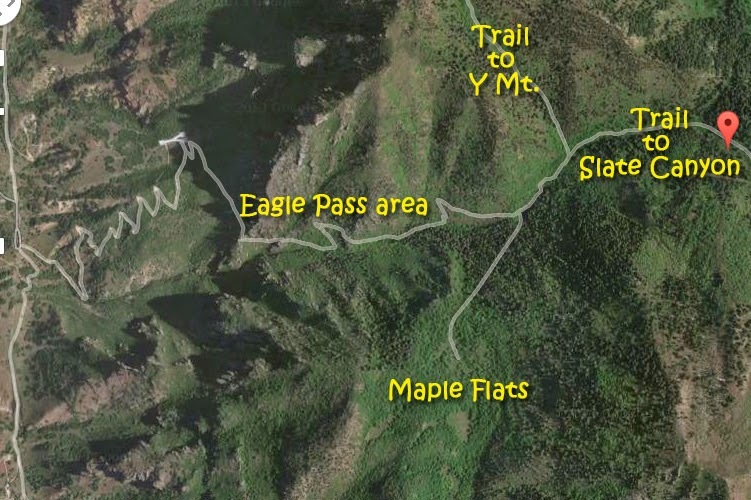 Rocky Sea Pass is about 11,700 ft. high, 8-9 miles from the Trailhead and leads to the Rock Creek Drainage. Early in the season there is always a large snow drift blocking the trail on the east side of Rocky Sea Pass…..so be careful. There is high traffic on the Highline Trail. I met some of them as we are seeing, got a few photos of others–to whom I gave my card promising to email them their pictures if they emailed me, and there were many others I didn’t meet nor get photos of. A mile or so from the Trailhead we come to the Wilderness Area boundary. From here on the rules and requirements for human use are ramped up quite a bit. The forest is coming alive with many life forms, such as mushrooms……. ……and always one of the early flowers is SPRING BEAUTY, whose beauty is generally ignored or not noticed as it is very tiny…about 1/4″ in diameter. 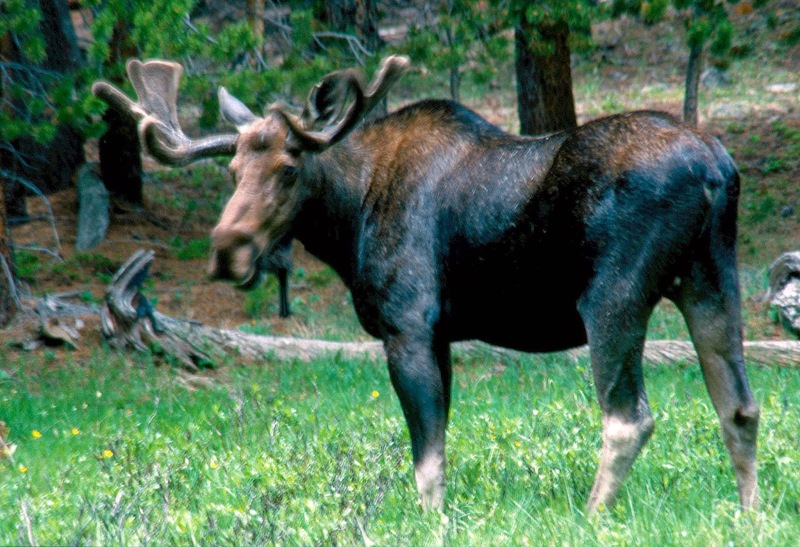 Look what hiking at a “stalking pace” and getting down on your knees can reveal! This is the first mountain scene to the north of the trail….and maybe we can say it is the southern end of Hayden Peak….named after a famous geologist & surveyor as explained in the beginning of this post. Mt. Agassiz becomes the dominant mountain as we will see throughout the entire trip. Louis Agassiz was a naturalist (paleontologist, glaciologist and geologist), and in a sense it was after him, and his profession that the Naturalist Basin was named, with most lakes in the entire area named after his students. 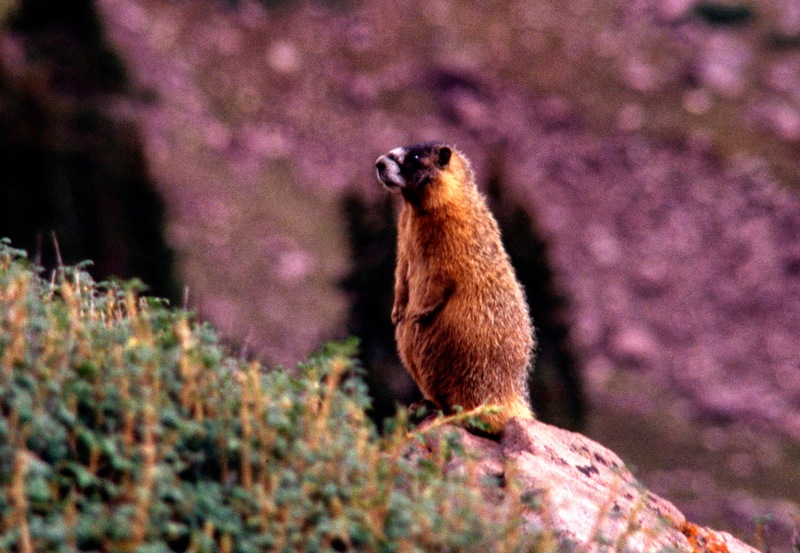 All of a sudden two new High Uinta Friends remarked that they knew me. Neal on the right happened to be the brother of one of my favorite Springville neighbors, Luke Hopkin. Ryan is a cousin. 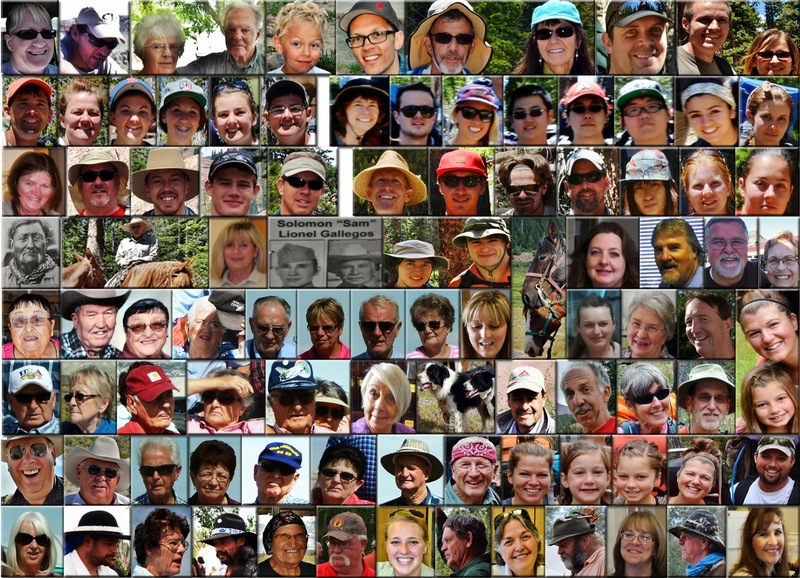 But, as you’re seeing, for me backpacking is usually a social experience with many new friends each trip….like the mosaic below of all my new “friends” from 2013. How can one feel lonely with so many good friends? 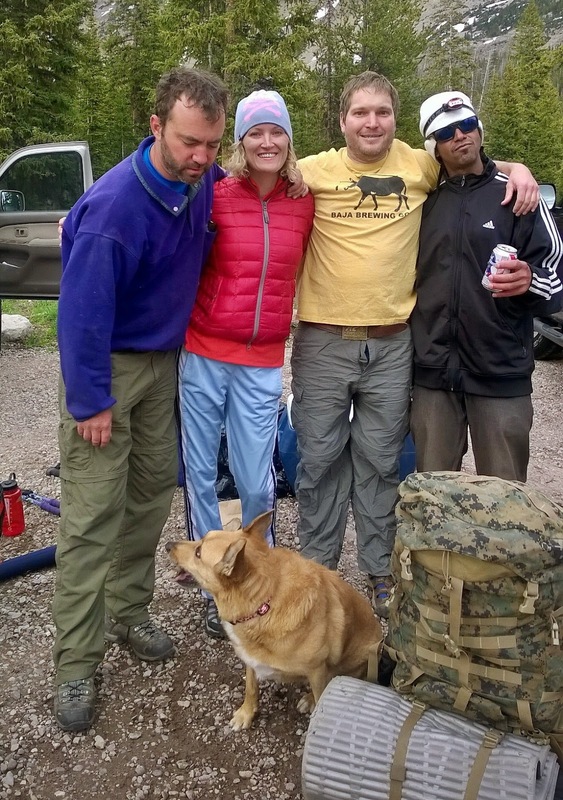 Quite a few of the hikers had their dogs accompanying them…this one actually carrying his (or her) own load. One of the real special alpine wildflowers is the Glacier Lily or Fawn Lily. This one and all of the hundreds of varieties found in the High Uintas are for me wonderful testimonies of the Creator’s talented Hand and love of beauty. Actually my total of wildflowers photographed now comes to 316 from the foothills to Kings Peak–316 testimonies of our wonderful Creator. Two miles (2.17 miles) from the trailhead we come to the sign pointing to SCUDDER LAKE. Many times I have walked by, but this time took off down the trail and soon came to the lake. Of course the Highline Trail further along comes real close to the lake, but I was looking for a special angle. 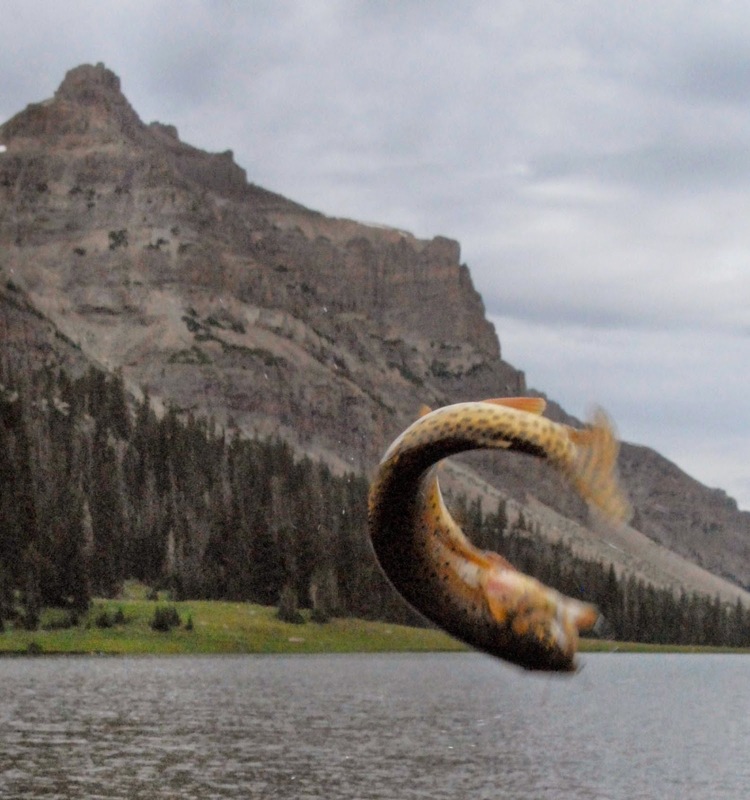 The DWR’s pamphlet on the Duchesne River Drainage first states Scudder Lake is “productive” but ends saying it’s “subject to winterkill and does not sustain fish life.” I tested its waters for fish, but couldn’t come up with anything. I hiked down around the southwestern end to get that “special angle” that puts in the portrait Mt. Agassiz with my fish eye lens. We are now back on the Highline Trail, still heading east with Mt. Agassiz to our north. Soon more new High Uinta Friends appeared. This handsome couple is Don & Nancy Eggert. Candy Tuft is another of the flowers that decorate the edges of our trail. And of course there are ROCKS….not near as many interesting and colorful ones as I saw in the Brown Duck Basin, but once in a while I got shots of some fascinating ones…..
…..and of course more mushrooms, this one being the Orange Sponge Polypore that we will see in various forms during the backpack. Zooming in we see a baby backpacked on the Highline Trail. 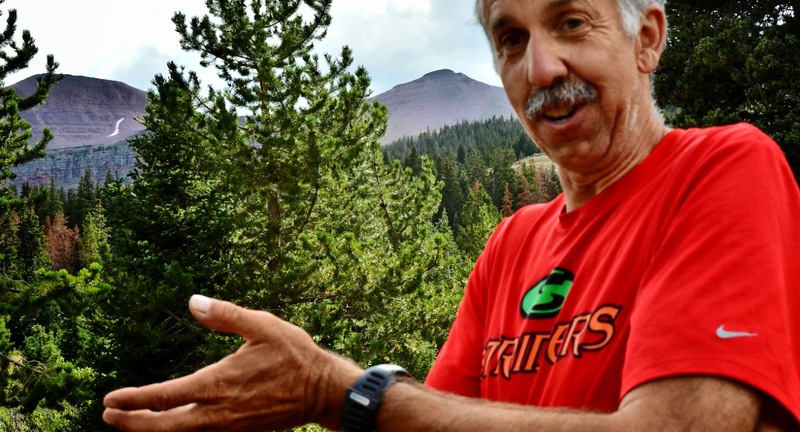 Russ and his buddy, Rich Hagle, came to the conclusion they knew me from the Salt Lake Tribune article published back in 2011, written by Brett Prettyman. Russ recalled vividly the full-page spread with a picture of Reconnaissance Lake and Triangle Mountain. He went on to relate them having now made 3 trips to the area and we all agreed that this scene rivals Red Castle Peak as the most beautiful mountain scene in Utah. He held out his hand showing me the treasure discovery…that didn’t look very silvery. It’s a very weather tarnished SILVER quarter dated 1966. We bid farewell promising to keep in touch. Wow…Russ has great legs and also my REI backpack! Soon I arrive at WILDER LAKE, about 3.5 miles from the Trailhead, and decided to head for the southern end to set up my base camp…….but soon I found, or she found me to check me out, but she was GENEVIEVE HARMEN, Wilderness Ranger. Genevieve is the only Wilderness Ranger working out of the Kamas Forest Service office. She does supervise those who work at clearing the trails of downed timber, etc. She is from Oregon and has worked several summers in the High Uintas. Soon I was working my way towards the south end of the lake…and all of a sudden heard a loud SMACK! with a large swirl out in the middle of the lake. I sat for a moment and soon…..
… a beaver surfaced and headed across the lake. As I began moving out– at least 200 feet from the lake so I could have a campfire and cook a little food, I passed a couple of patches of snow….the first I had come close to in my two backpacks. I set up camp 250 feet from the lake, quickly got some water from the lake and put it through my Gravity Works purification system–which I repeat is INCREDIBLE.! I then prepared my recovery drink to restore my apetite and have me feeling good enough to go fishing. The formula: egg-nog/Endurox/Calcium/Magnesium/glutamine/electrolytes recovery drink. It also has a ground up energy bar–ground in my Nutri-Bullet blender since my poorly fitted dentures can’t handle hard stuff! Soon I was down at the lake catching pan-sized Eastern brook trout that were surfacing all over the lake..
.…and there was buzzing all around! ….and he’s getting me near my eye…..
….and this one is getting his fill of my blood from my leg. TIME TO GET OUT THE REPELLENT! It’s got to be from 98 to 100 percent DEET! Mark my words, the 30 percent stuff just doesn’t work! The next day I headed south on a day hike to Wyman, and Packard Lakes, and to witness again the Canyon of the East Fork of the Duchesne River. In my photo waist pack I had my SPOT Tracker, clipped on one side the sat phone, and on the other side my Colt .45. In addition I had my headlamp, and weatherproof matches in case of any emergency need of light or fire. My food was another of my home-made energy drinks, and water. Another mushroom. I’m not quite ready to say a lot about them….so for the present have extreme caution. 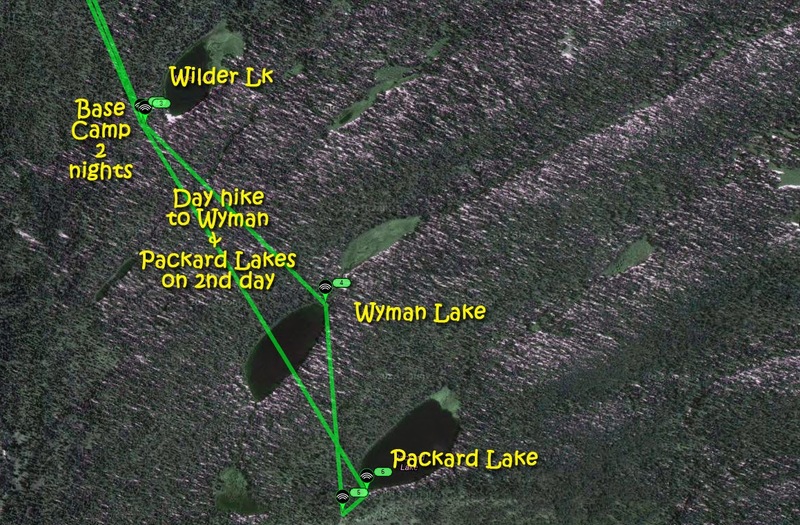 About half a mile, including some elevation gain, I arrive at WYMAN LAKE. It’s a pretty lake that looks like it should have fish, but the pamphlet states that it is subject to winter-kill, but occasionally stocked . I tested its waters for fish at the inlet, and here and there around the edge as I followed the trail to the south end, but with no sign of fish. 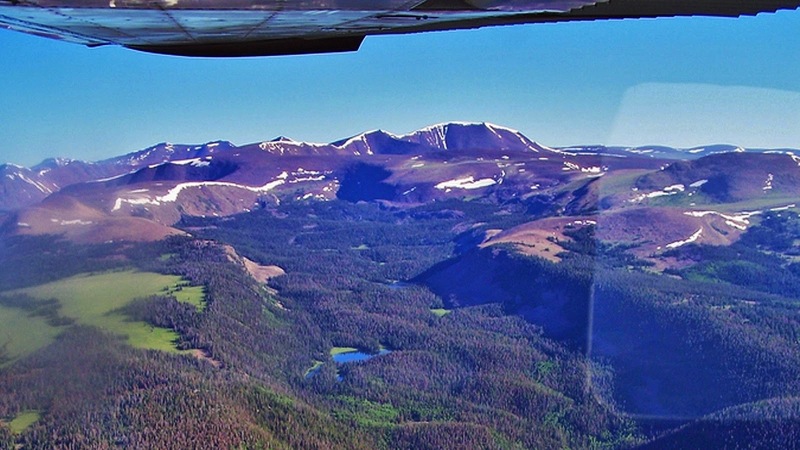 Here’s a fish-eye view looking north towards Mt. Agassiz. 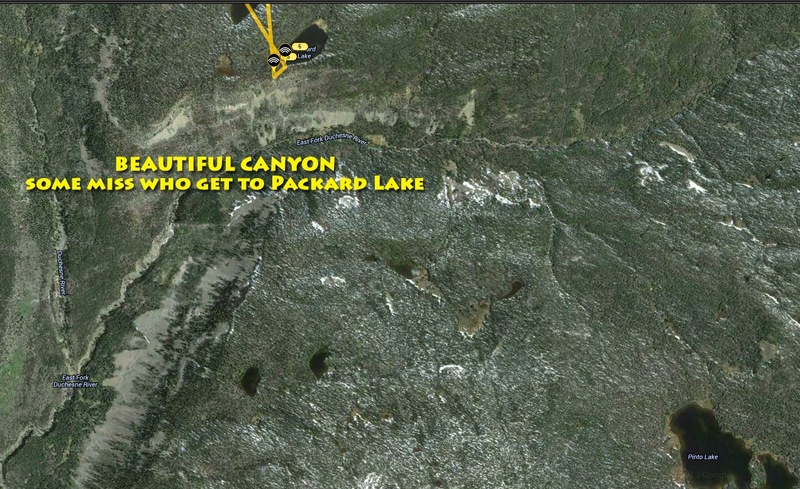 I then continued on towards Packard Lake, but with one suggestion for the hiker. The trail divides, the main one going up over a hill which then drops down to Packard Lake. The right hand fork continues over level ground skirting the edge of meadows and then comes to the Canyon following near the edge up to Packard Lake. It’s no big deal, but it’s easier and will give you a glimpse of an incredible canyon that those who take the other trail often never even see–and they miss one of the great sights of this hike. 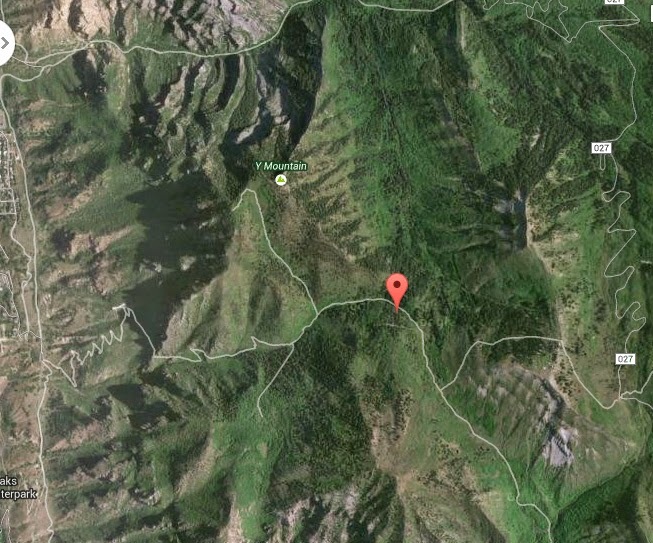 Here is the SPOT Tracker view of the hike in the area down to Packard Lake. 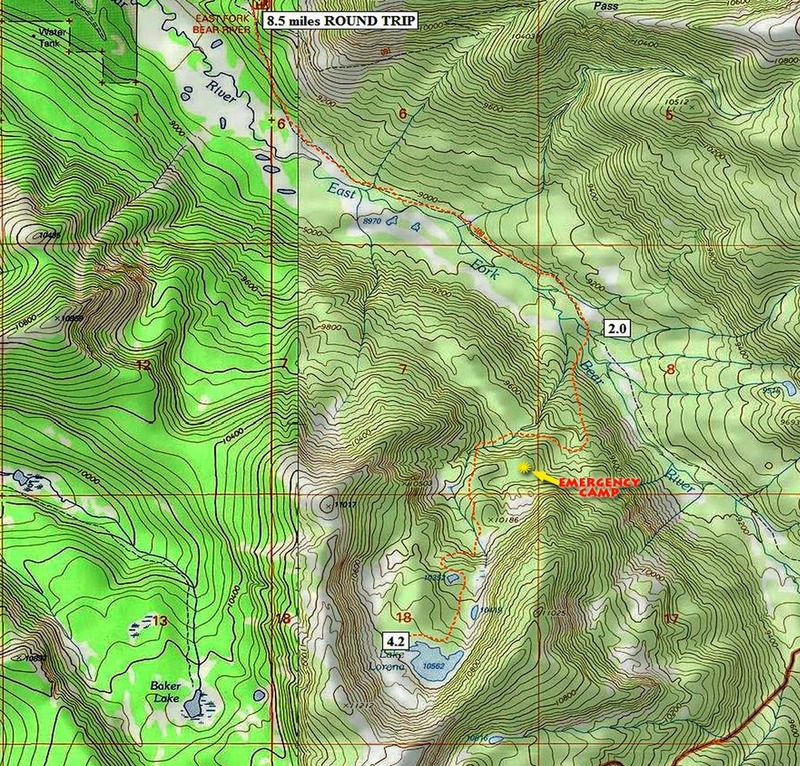 From the Trailhead where I hit the OK button first, then at Scudder Lake, and then at my base camp at Wilder Lake. 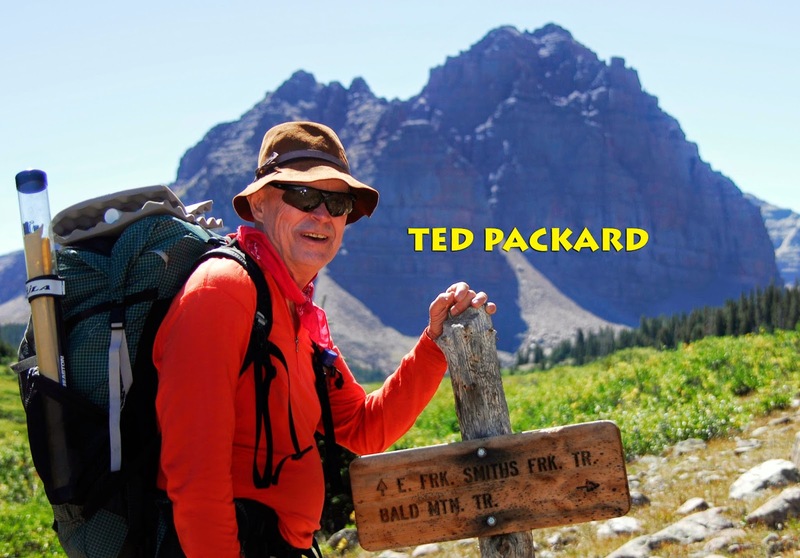 Then on the day hike I hit it again at Wyman Lake, then on the edge of the Canyon, and at Packard Lake, and last of all in the evening when returning to my base camp..
PACKARD LAKE, at 10,000 ft., guarded by Mt. Agassiz, is always visited with the Ted Packard family in mind. 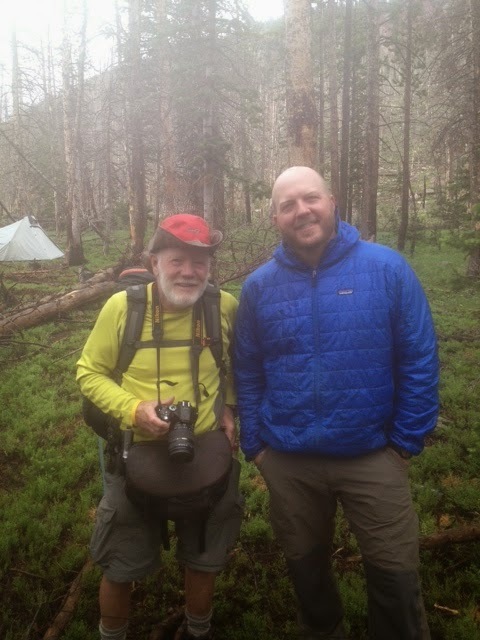 Ted was one of the first two who introduced me to the High Uintas in 1952. Those two, Ted Packard and Charlie Petersen, along with me in 2008 had our Golden Anniversary Backpack to the Red Castle Area you see below . 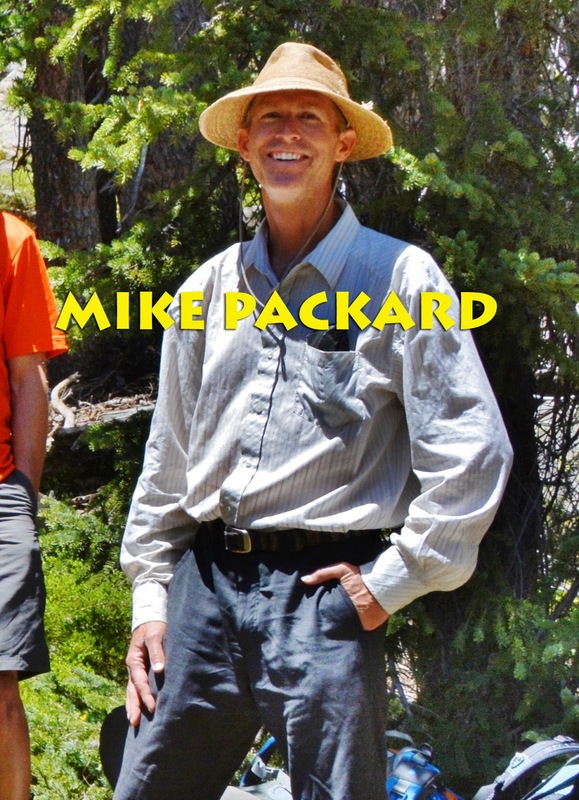 The other Packard on my mind at this lake is Ted’s son,Mike who is another great High Uintas Friend we see above. Without them I might have never had the interest in backpacking to Packard Lake. Thanks, to both of you. Let me show you….the outlet stream from the lake which soon ends…. …..and then turns into a waterfall at the beautiful edge of the canyon. Expanding our view we look up the Canyon of the East Fork of the Duchesne River towards the Four Lakes Basin, and almost visible is Cyclone Pass. We look here down the Canyon which eventually will take you to the North Fork of the Duchesne River, Hades Canyon, and Defa’s Dude Ranch. 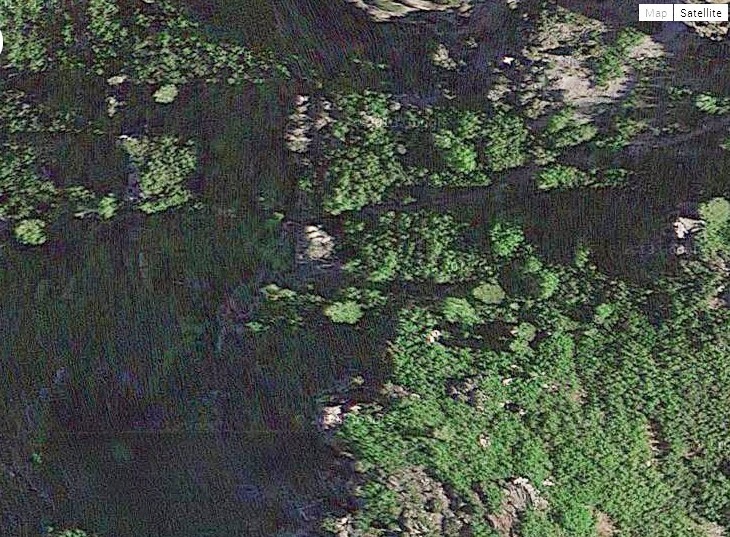 Zooming in on the river has me thinking that this would be a great Fall backpack, after the mosquitoes are gone, hiking and fishing the river up from Defa’s Dude Ranch. Back to Packard Lake we observe the Yellow Pond Lilies beginning to surfacer. 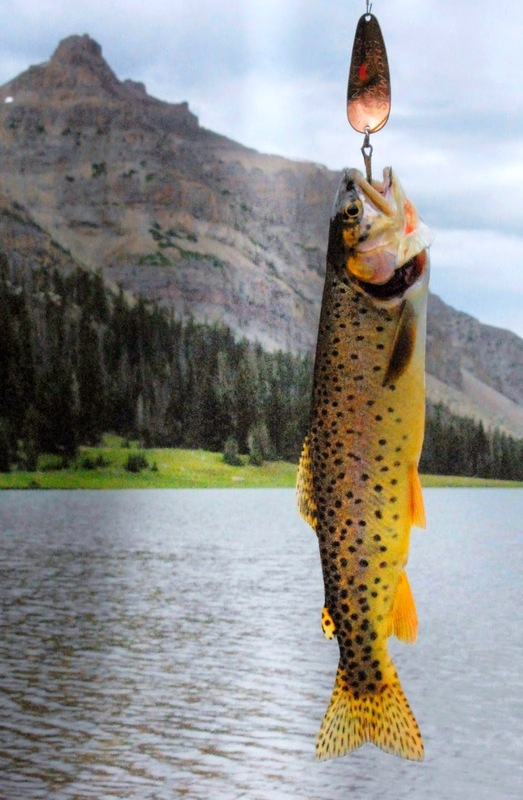 Fishing produced pan sized Eastern brook trout, but also one that was larger, and some very hard hits–one that took my lure and I could see the colorful brookie thrashing around with a Thomas Cyclone in his lip. Hope he survives and is one day caught by a fisherman–who can return to me the lure for a nice reward! Soon I headed back to my base camp at Wilder Lake. I relaxed resting from my several mile long day hike, and prepared to head out the next morning, always in awe enjoying the beautiful changing scene as the sun sank into the western sky. A flickering campfire at the inlet had me zooming in…….. I understand the warming emotion of a family campfire as the night’s chill comes on, but somehow we’ve got to make a sacrifice moving at least 200 feet from the water, and thus avoid violating the law as these campers are doing. I guess with this sunset view of Mt. Agassiz we should end the show…..but I had to get out of there and along the trail the next morning had experiences I have to share. So the next morning, June 30th, I bid farewell to Wilder Lake and headed up the trail. As always, SPOT Tracker at hand ready for emergency use, as well as sat phone clipped on my camera waist pack, and on the other side my Colt .45. The camera, that was taking the picture, would be hanging around my neck with one hand steadying it and ready to click off that once-in-a-lifetime shot. No need of trekking poles–not enough hands to work them anyway…and they do require “work” expending extra energy, a luxury this old guy can’t afford. Soon I was back to the Highline Trail. Along the stream the Bluebells are budding out and will soon add their beautiful flowers to the scene. The tiny Alpine Lewisia makes its contribution to the magnificent hike–but you have to zoom in to appreciate its beauty..
And I wasn’t about to stop meeting wonderful new High Uinta Friends….and little did I know that just around a few bends in the trail a really WOW one would appear in a flash! Alpine buttercup along with a host of others raised my spirits even a little higher. Soon a Boy Scout group, came down the trail…..
….and I met BEN KENNALEY, and CLARK JONES..
Ben’s father and others brought up the rear….all heading for the Naturalist Basin. 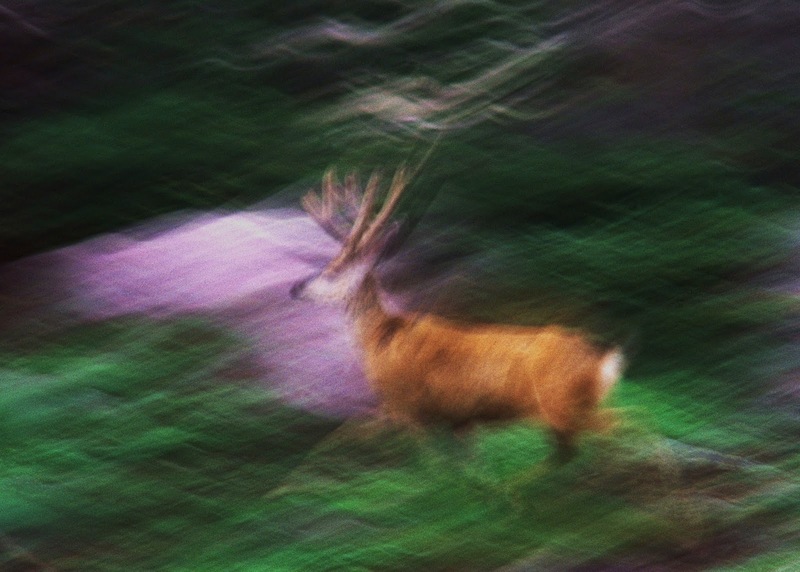 Then in a FLASH a “WOW MOUNTAIN RUNNER” with her running companion whipped by me in a blur….. Us old guys can sometimes get away with that kind of joking that no one is going to take seriously, but I had stops to make along the return trip home, so stalked up the trail, soon seeing Mt. Baldy off to the west…..
….and soon I was at the Trailhead having done around 12 miles, including extras, and hit the OK button on my SPOT Tracker…. .. then headed for my tiny “Cabin A” home, freshened up a bit and set alongside of me some snacks for the road, and headed for the first stop–Bald Mt. Pass. 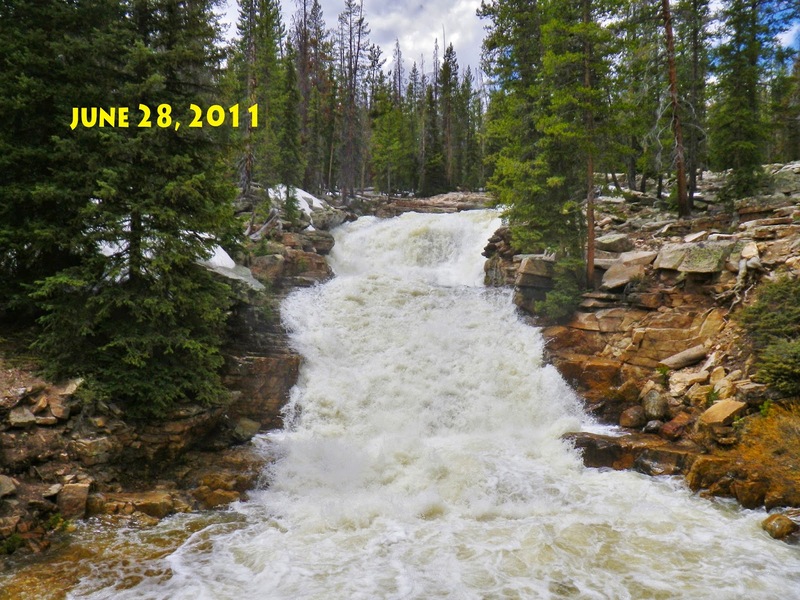 Then on to PROVO RIVER FALLS for the annual photograph to also give us an idea about the season, compared to other years. While at the Falls I all of a sudden recognized someone, and she recognized me…. 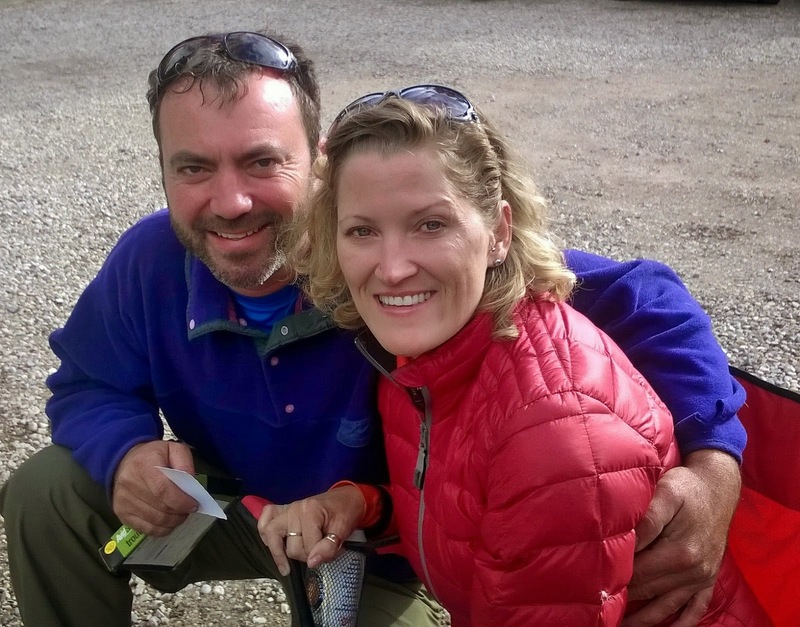 She was the “WOW MOUNTAIN RUNNER!” and I met JENNY POWERS, and told her that I had almost waited for her at the Trailhead to ask, “Will you marry me?” and quickly qualified that to make sure she knew I was just an old guy doing my best to joke my way through what’s left of my life. She picked up on the thought and mentioned her boyfriend might want to fight me over her. 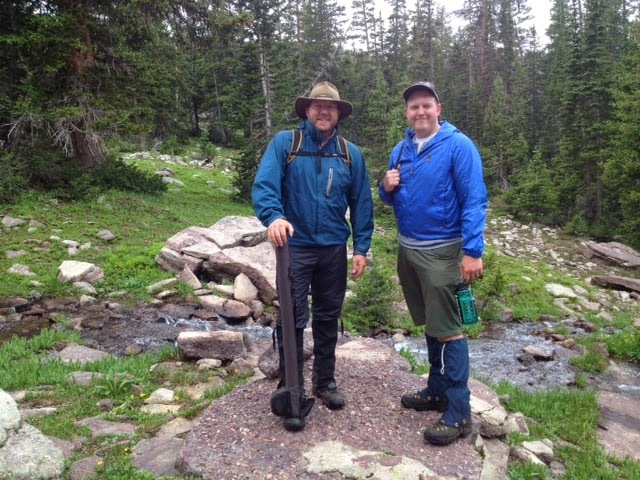 We talked about the High Uintas Wilderness Project–my going on 1,700 miles of backpacking, and my years in Guatemala–with the prediction on leaving in 1967, “You’ll come running home with your tail between your legs in 6 months!” ….and finally I did come “running home with my tail between my legs” but 35 years later!
. I learned she is from Georgia, and wants to backpack the Highline Trail later this summer but thinks her and female companion will have to eat a lot of fish….but she doesn’t know how, so asked me to teach her. As we were saying goodbye, she asked, “Can I hug you?” How could I refuse such a nice request…..so I got paid for my 12 torturous miles on the trail with one great hug! I recalled at Reams Supermarket where I worked from 2009 to 2012 as likely the oldest “shopping cart herder” in the world where I loved to serve the ladies (and everybody else too), but was restricted by management to receiving and giving hugs only to those over 90! WOW! IT’S GREAT TO BE FREE! Then on to Coalville and Summit County Courthouse. NaVee Vernon, the Historical Director, had advised me that they had framed the large print I had donated and I was curious to see it. Susan Avard, of the Office of Community Development, and NaVee took me to a Conference Room and showed me the beautiful framed photograph of what many think is the most beautiful mountain scene in Utah and it’s in Summit County as is nearly all the North Slope. 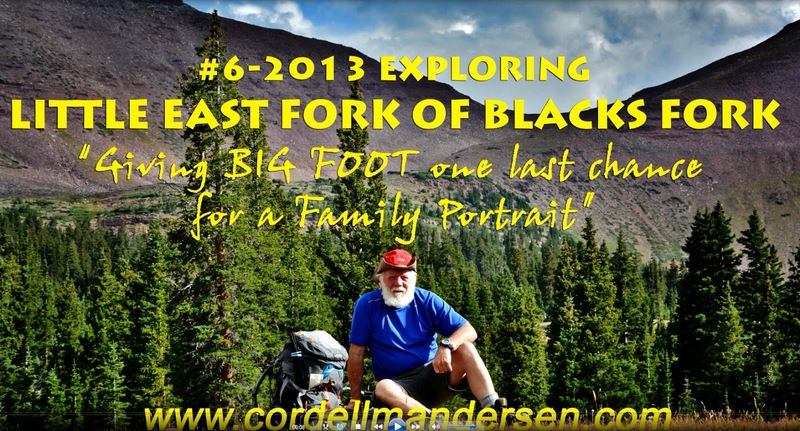 At Coalville I hit the Ok button and then headed for the Wasatch Front………. ……. American Fork where I hit the OK button on my SPOT Tracker to end the trip. So here we see the whole trip as it is on the SPOT Tracker website, showing all the OK signals and the message sent as seen below. I’m happy to say that progress was made. I didn’t experience any High Altitude Sickness, my balance greatly improved, and I felt great on finishing the trip….of course “the hug” helped a lot! But I was embarrassingly slow that would make most of my scheduled trips too long and quite impossible as too much food would be necessary. Besides, I rationalize, most of those “Dream Backpacks” are to areas I have already been through, so they aren’t critical to my project. I’ll just back off a bit but still keep working at getting back in shape, with shorter trips, and hope to eventually be back to what I consider normal–if there is anything normal for an old guy in his 79th year. So no “GIVING IN” yet, rather carefully, and persistently going forward doing the best I can and hope to eventually be able to “Pick up the pace…lengthen my stride..and increase the distances.” .…but fill in my time with what is now critical research and writing. So keep an eye on my website where I’ll announce further attempts to get the job done.